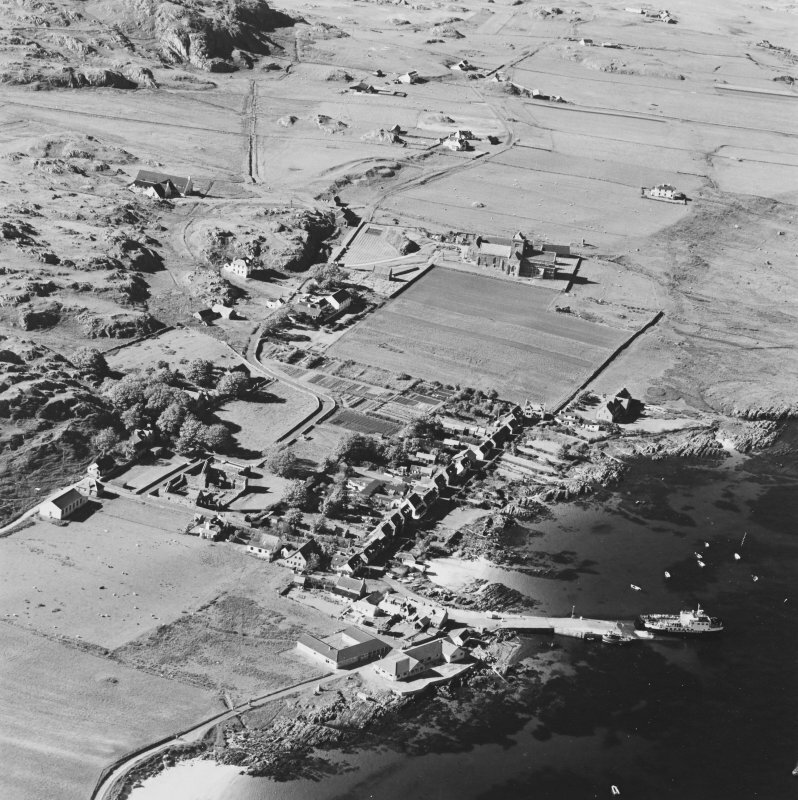 Oblique aerial view of Iona, taken from the south east, centred on the town. 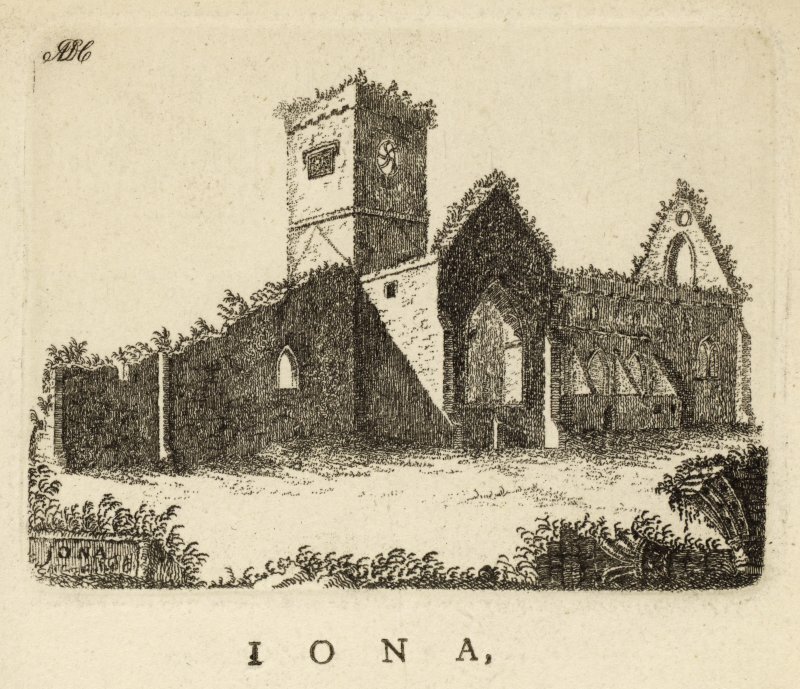 Iona, Iona Abbey & General. Oblique aerial view from South-West. Iona, Vallum & Abbey. Oblique aerial view from North. 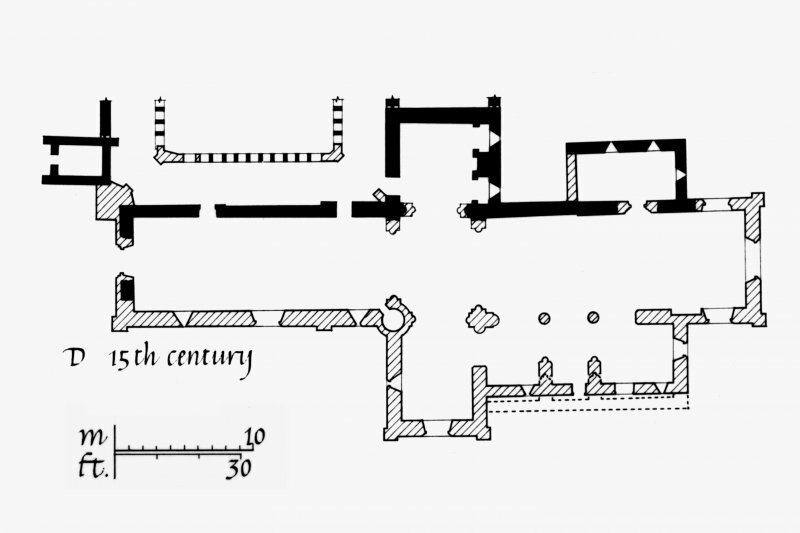 Drawing showing floor levels in the crossing of Iona Abbey church. 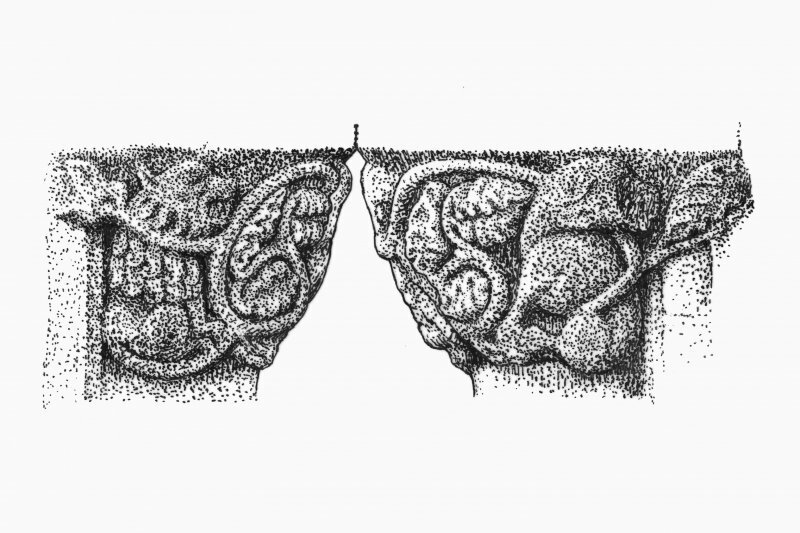 Drawing showing windows in S wall of refectory, Iona Abbey. 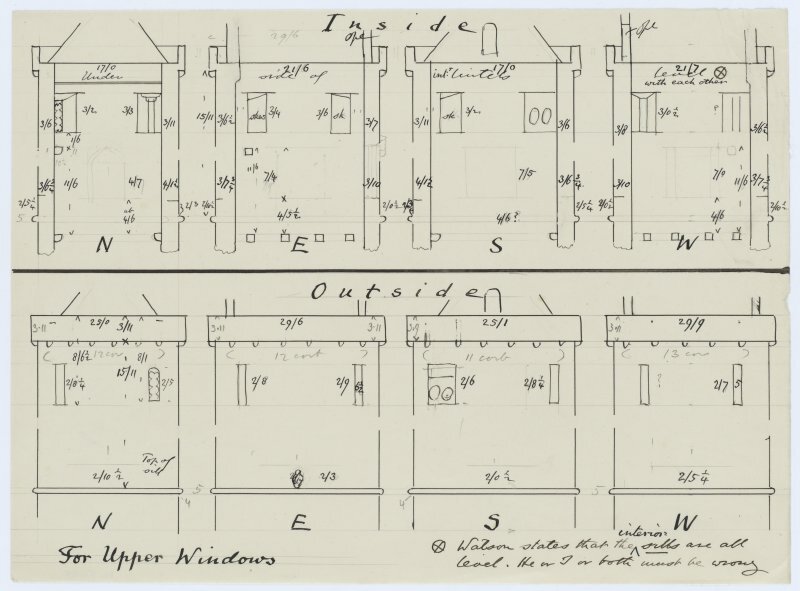 Drawing showing sketch of windows in N wall of refectory, Iona Abbey. 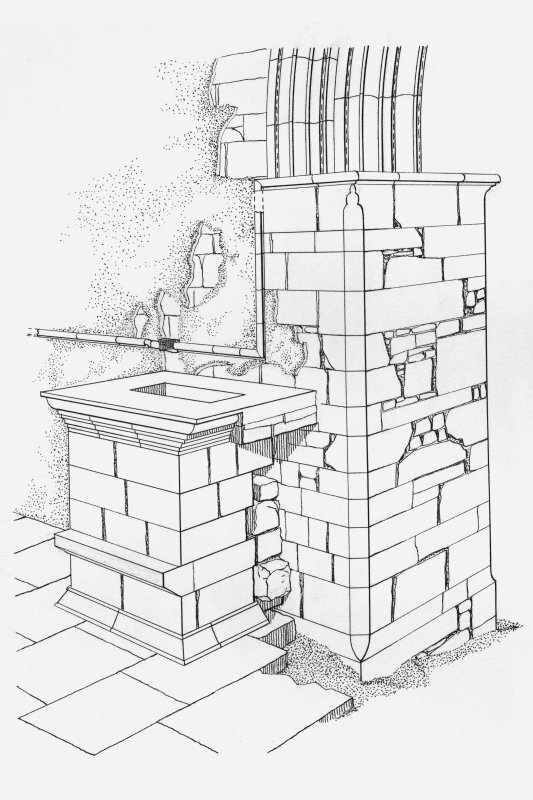 Drawing showing internal section of N wall of refectory, Iona Abbey. Drawing showing external elevation of N wall of refectory, Iona Abbey. 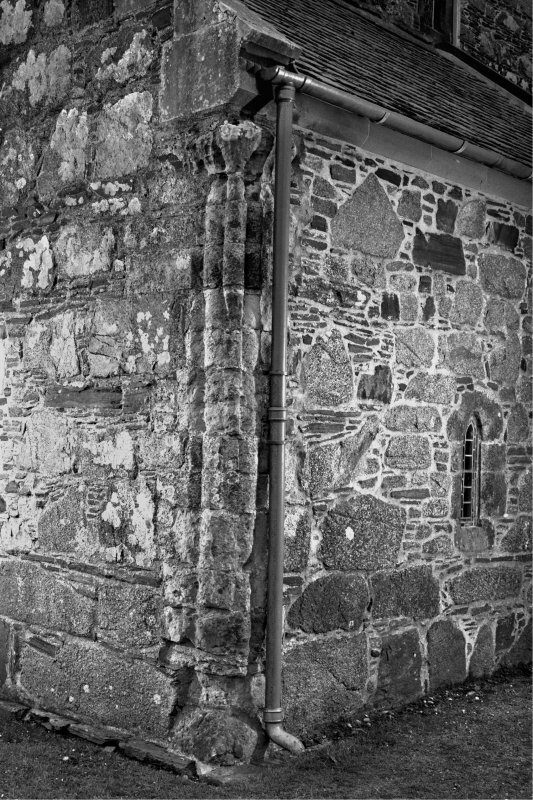 Record of levels in Iona Abbey church. Iona, Iona Abbey. 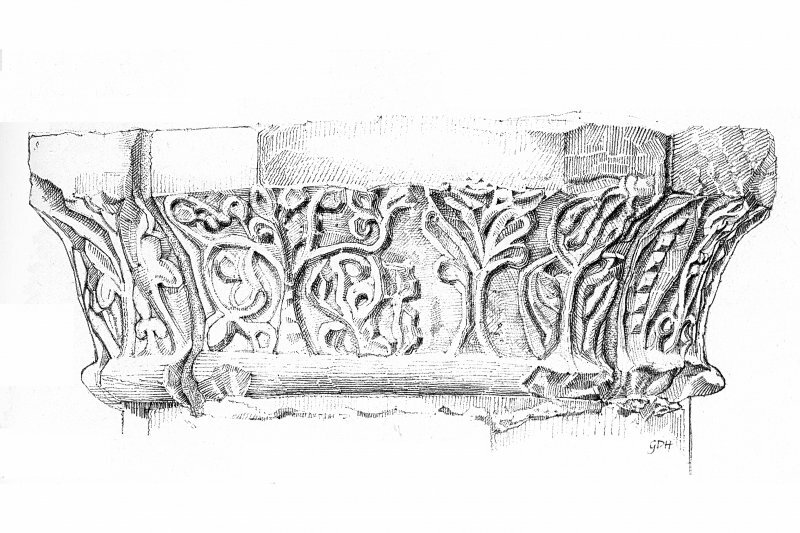 Sketch of chapter-house arcade showing detail of carved capital. 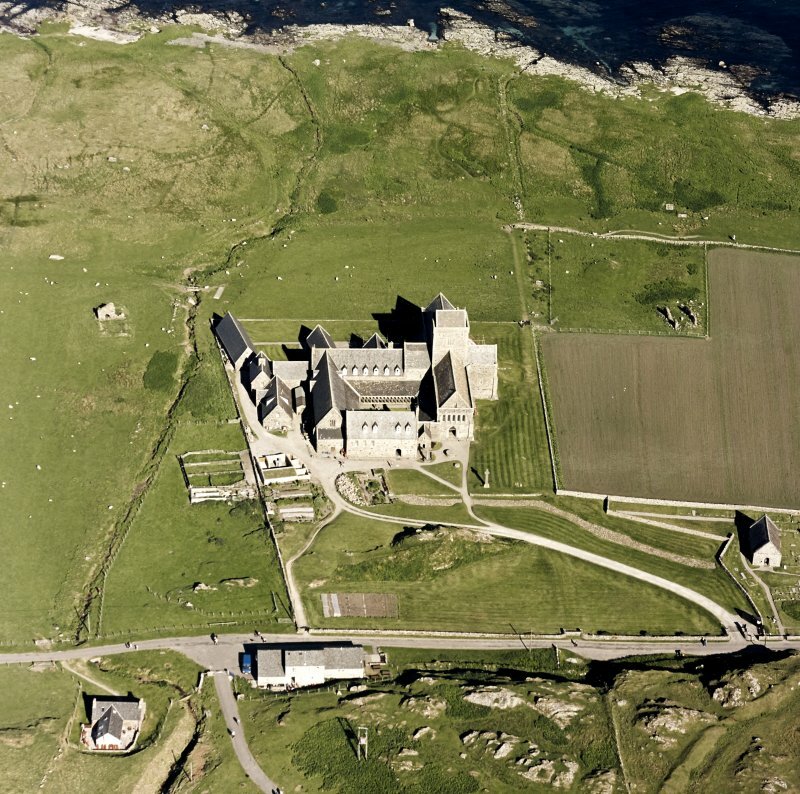 Oblique aerial view of Iona Abbey from NE. Oblique aerial view of Iona Abbey and Baile Mor villlage from N.
Sketch showing internal and external elevations of the upper part of the tower of Iona Abbey church, showing the location of windows. 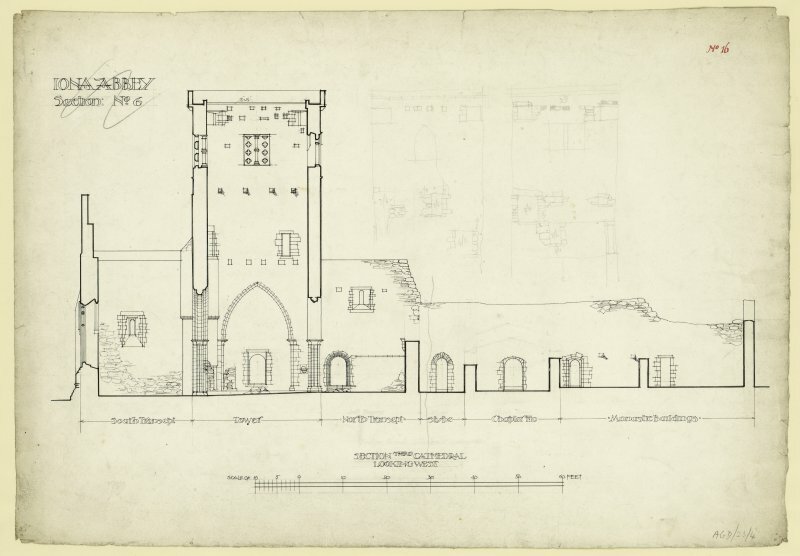 Drawing showing elevations and plan of NW corner of the tower of Iona Abbey church. Drawing showing Iona Abbey and Tigh an Easbuig from NE. 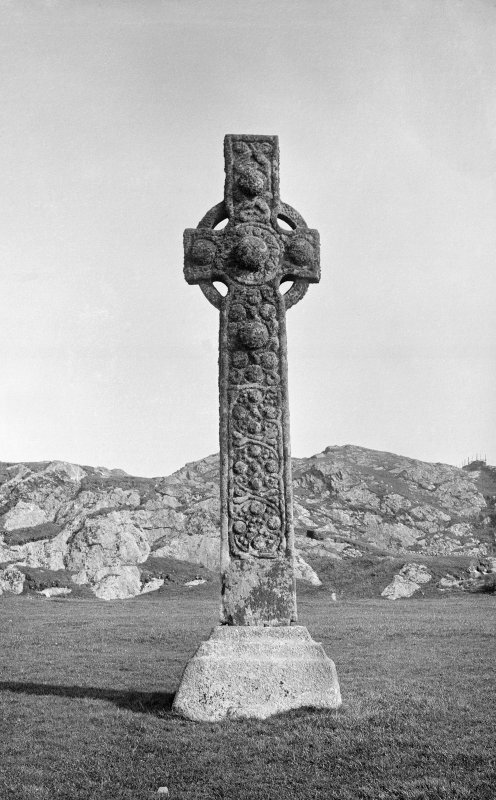 View of Iona Abbey and St. Martin's Cross. 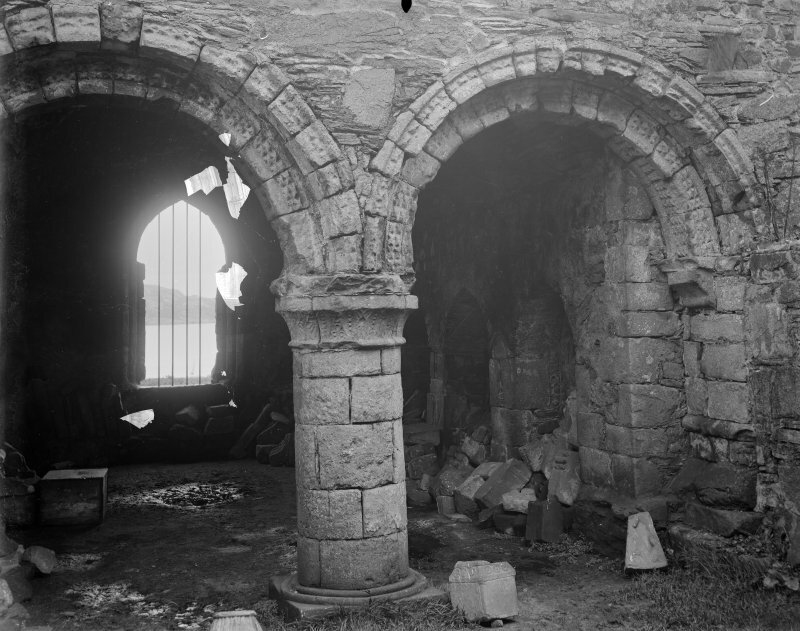 Interior view of Iona Abbey. 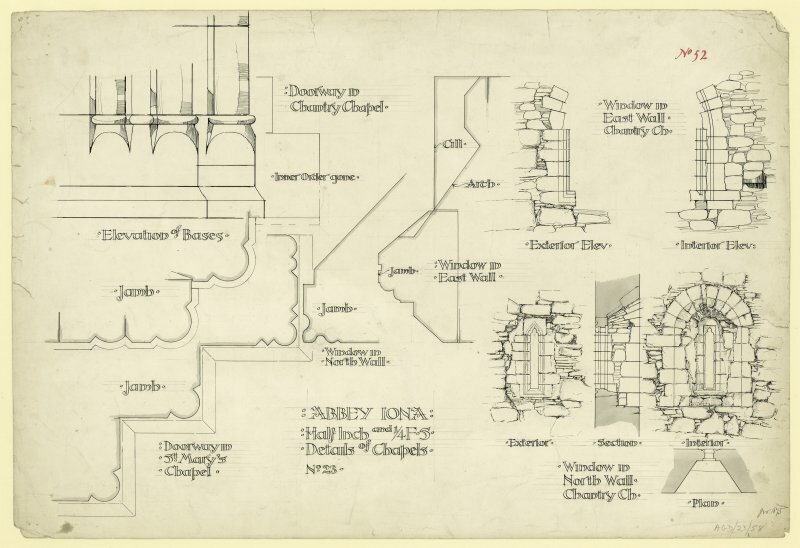 Plan showing elevations and sections of windows in chantry chapel and details of St. Mary's Abbey, Iona. Titled. 'Abbey Iona. Half Inch and 1/4 F.S. Details of Chapels. No.23.' Signed and Dated. 'J.W. 1875.' Iona, St Mary's Abbey. Photographic copy of plan of long section through transepts to chapter house looking East & West. 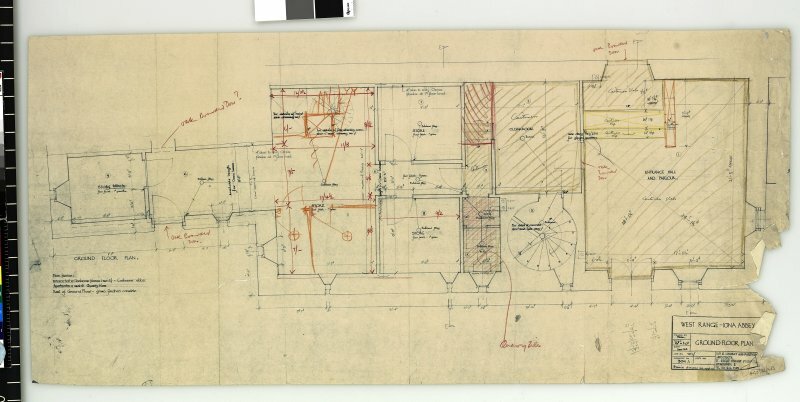 Plan showing details of elevations and sections of doorway from North transept to cloister and elevations of doorways to chapter house etc. of St Mary's Abbey, Iona. Titled. 'Abbey Iona. 1/4 F.S. Details of Door-ways to Cloister. No.39.' Signed and Dated. 'J.W. 1875.' Iona, St Mary's Abbey. Photographic copy of plan of long section through transepts to chapter house looking East & West. 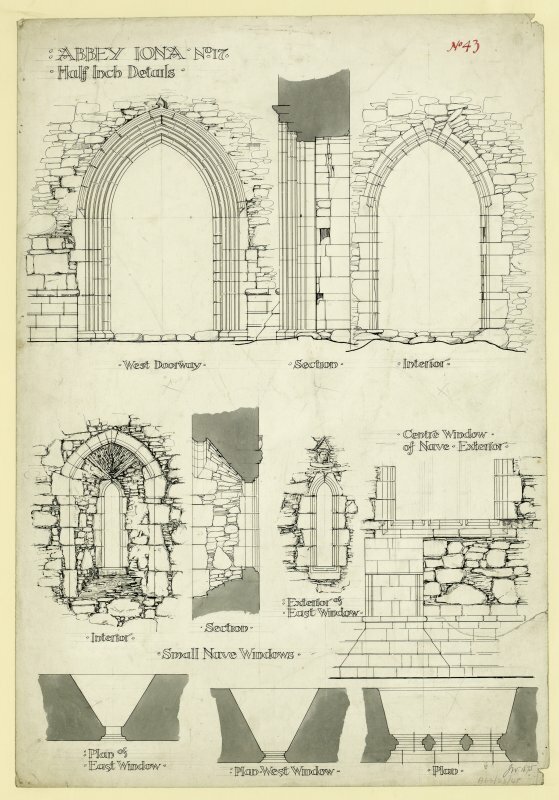 Plan showing elevations and sections of West doorway and plans, elevations and sections of windows South of nave of St Mary's Abbey, Iona. Titled. Abbey Iona. No.17 Half Inch Details.' Signed and Dated. 'J.W. 1875.' Iona, St Mary's Abbey. Photographic copy of plan of long section through transepts to chapter house looking East & West. 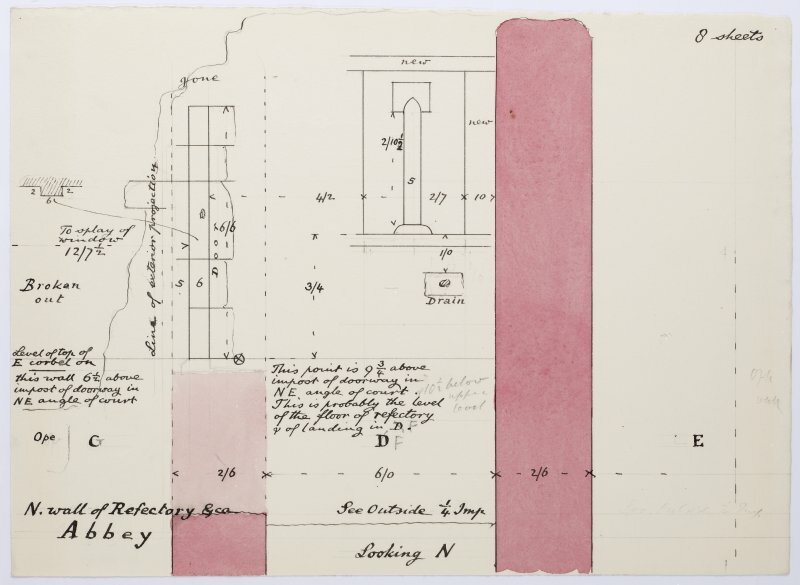 Plan showing details of of piscina in chapel South aisle of chancel of St Mary's Abbey, Iona. Titled. 'Iona Abbey. No.36. 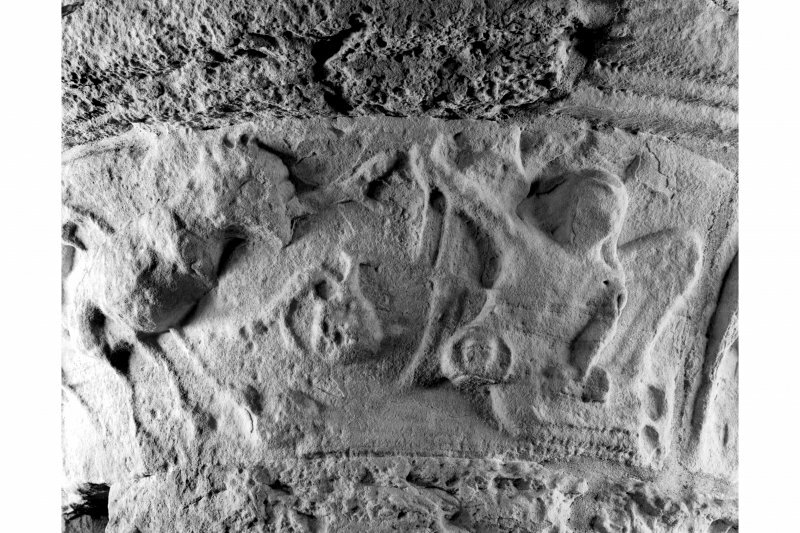 Detail of Piscina in Choir. Signed. 'Revised 8.00 A. Muir.' Iona, St Mary's Abbey. Photographic copy of plan of long section through transepts to chapter house looking East & West. 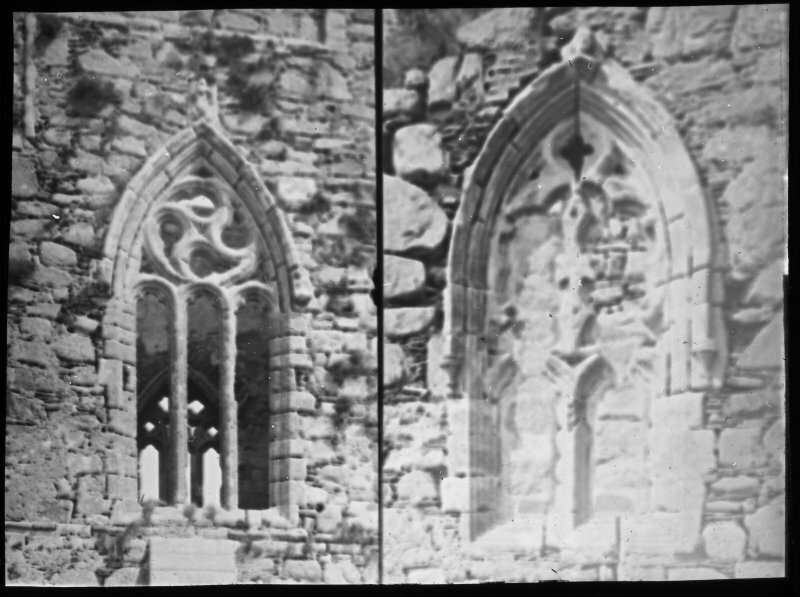 Plan of details of East and South windows, belfry stage of Iona, St Mary's Abbey. Titled. 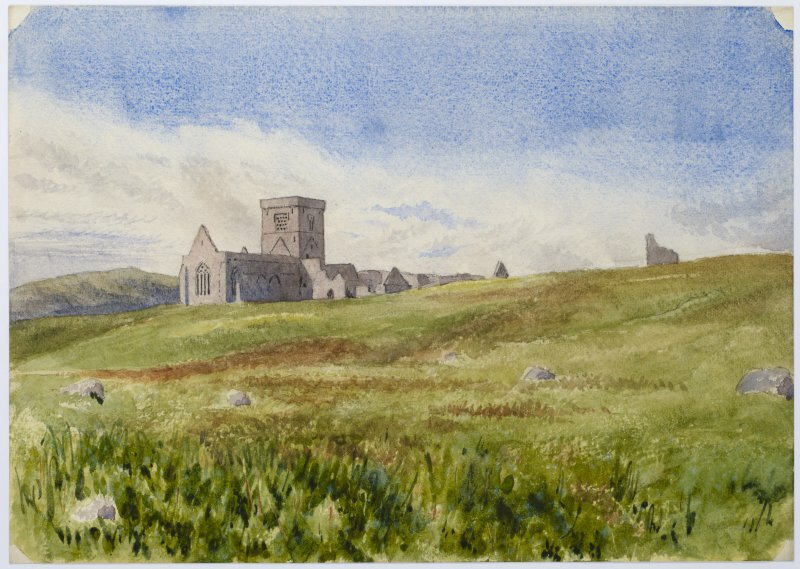 'Abbey: Iona. Details of Tower Windows of Belfry. 1/4 full size. No. 32.' Signed and Dated. 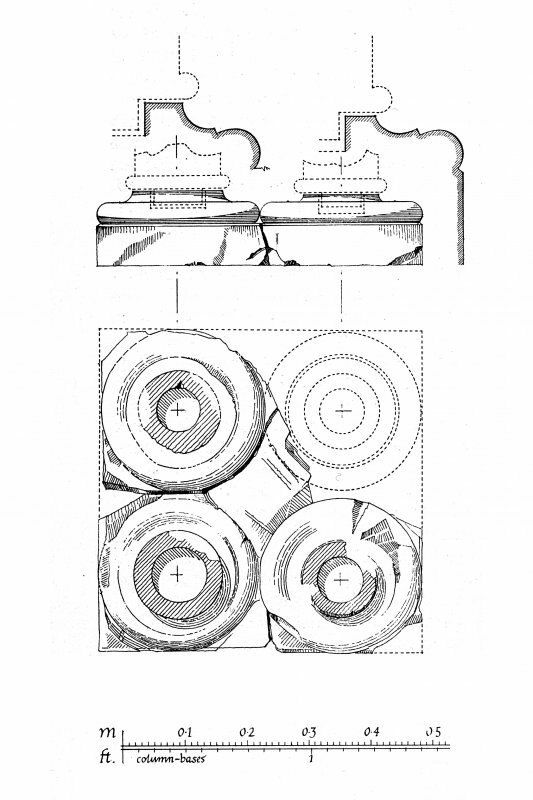 'JW 1875.' Iona, St Mary's Abbey. Photographic copy of plan of long section through transepts to chapter house looking East & West. Photographic copy of plan of church and conventual buildings. 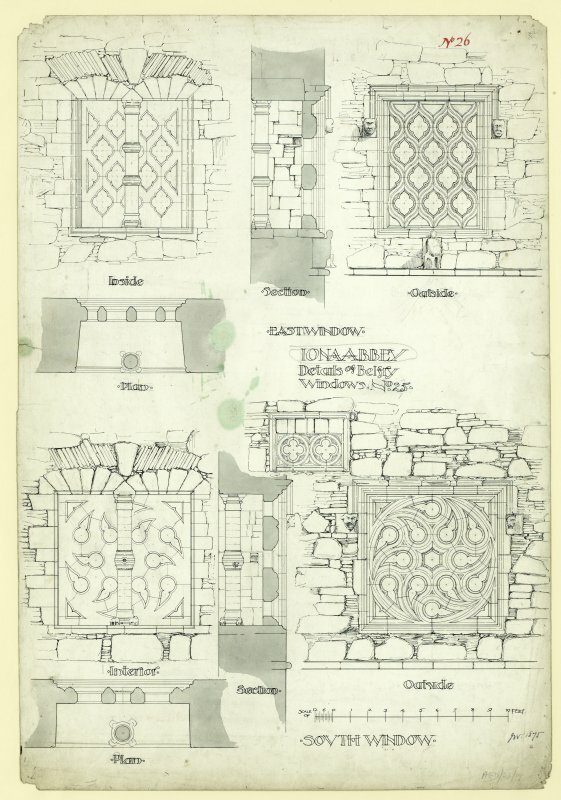 Plan of exterior and interior, elevation and section details of East and South windows of tower, belfry stage, of Iona, St Mary's Abbey. Titled. 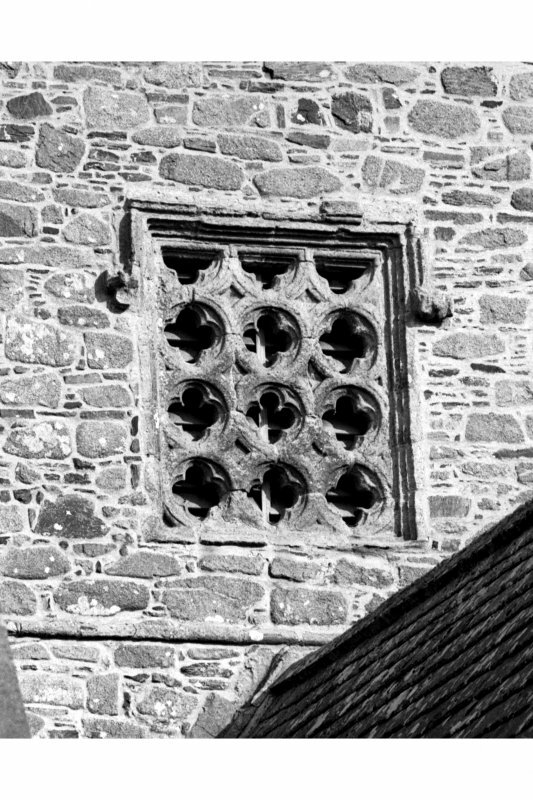 'Iona abbey, Details of Belfry Windows.. No. 25.' Signed and Dated. 'JW 1875.' Iona, St Mary's Abbey. Photographic copy of plan of long section through transepts to chapter house looking East & West. Photographic copy of plan of church and conventual buildings. 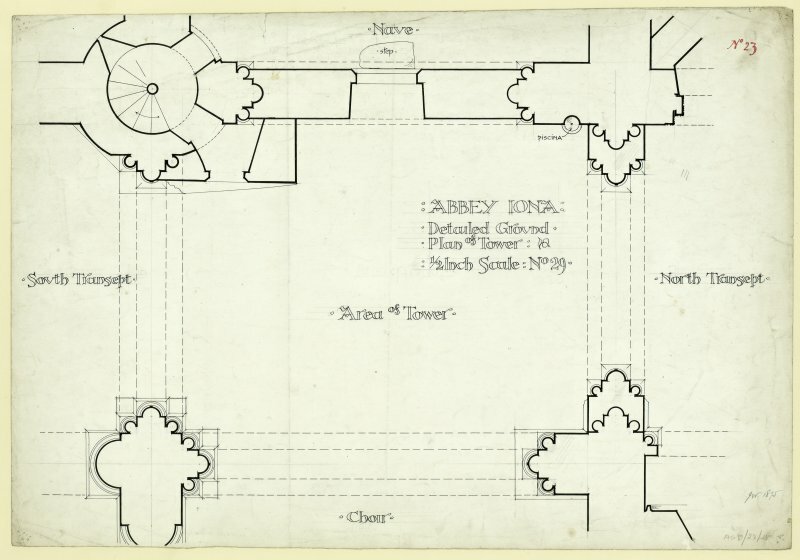 Plan of ground floor at crossing including details of the south transept, tower area, choir, north transept and nave, of Iona, St Mary's Abbey. Titled. 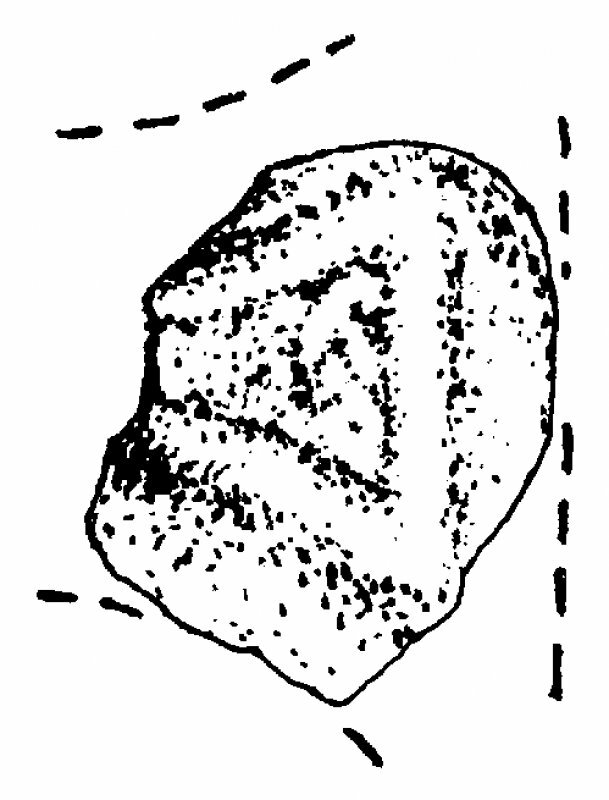 'Abbey Iona: Detail Ground Plan of Tower: 1/2 Inch scale: No.29.' Iona, St Mary's Abbey. Photographic copy of plan of long section through transepts to chapter house looking East & West. Photographic copy of plan of church and conventual buildings. 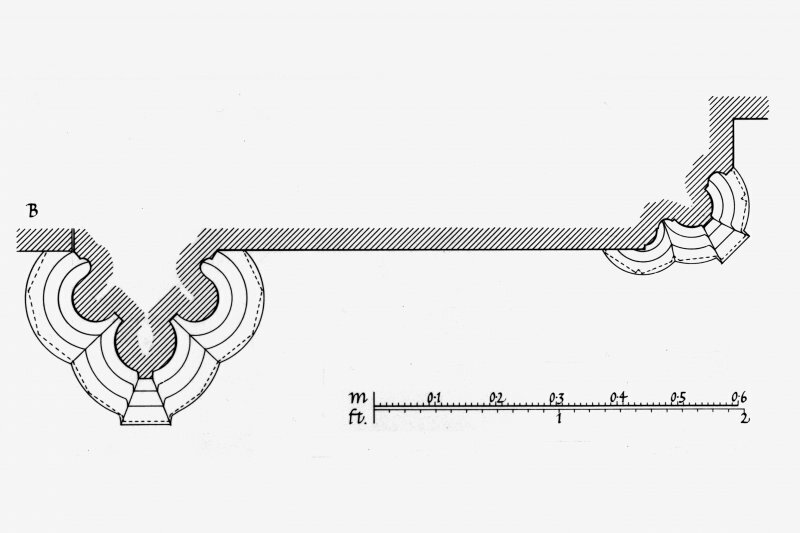 Plan of long section through cathedral looking west of Iona Abbey. Iona, Iona Abbey. Plan of proposed restoration of North transept. Iona, Iona Abbey. General view. 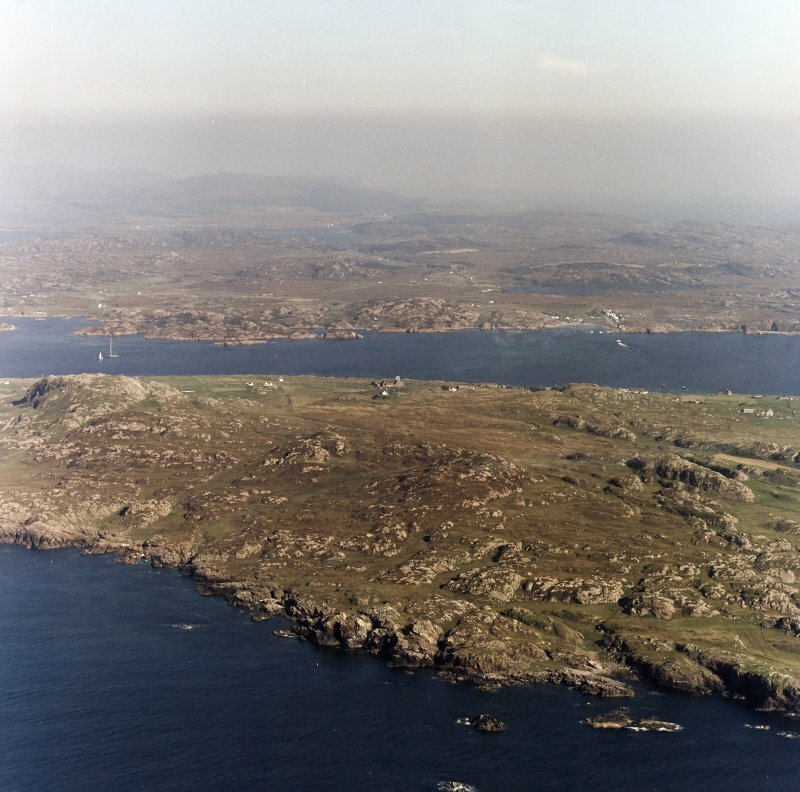 Insc: 'Iona Cathl from the West'. Iona, St Mary's Abbey, St John's Cross. General view. Iona, Iona Abbey. View of West capital on South aisle. 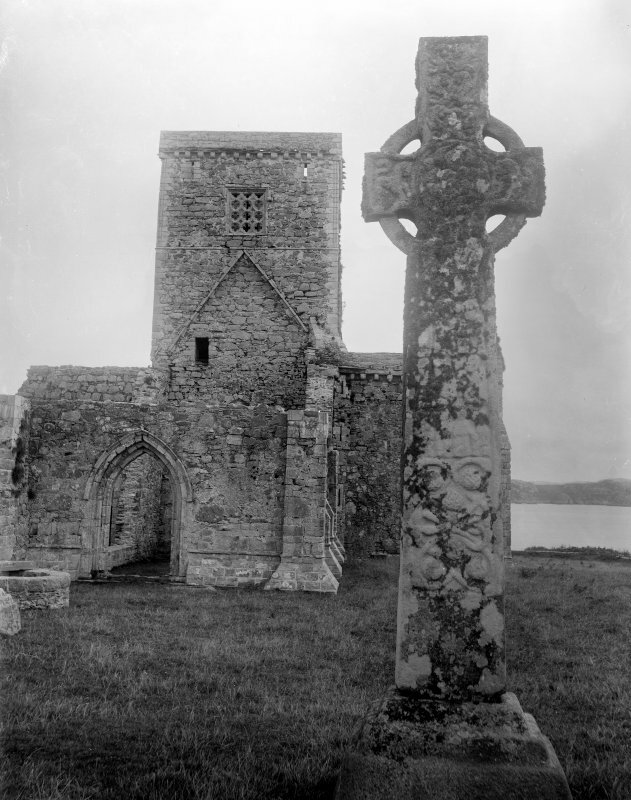 Iona, Iona Abbey. 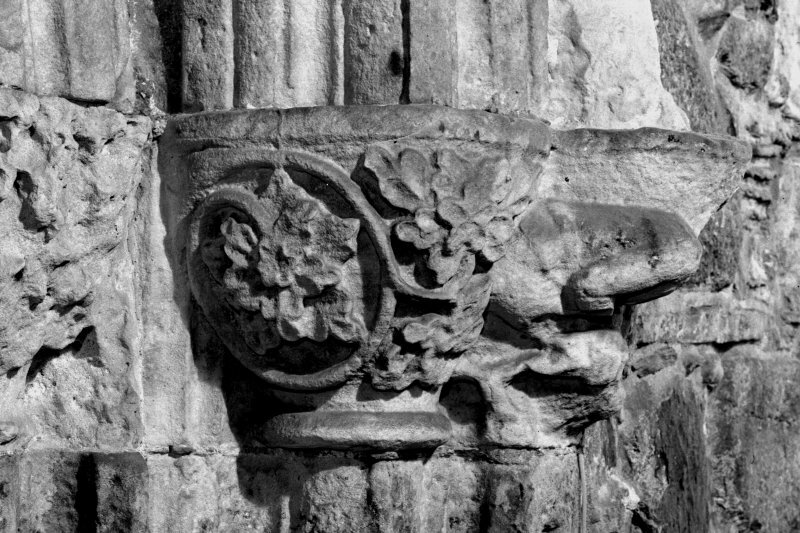 View of East capital on South aisle. Details of windows on south side. 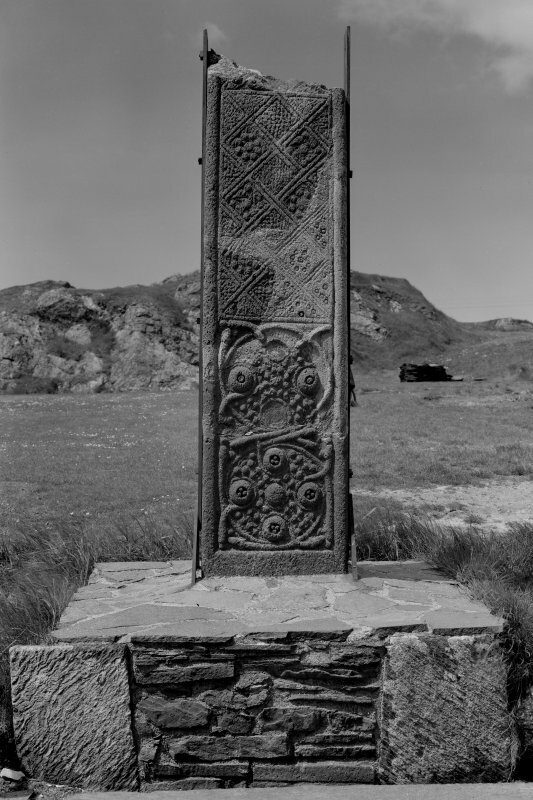 Iona, St Martin's Cross. General view of East face. 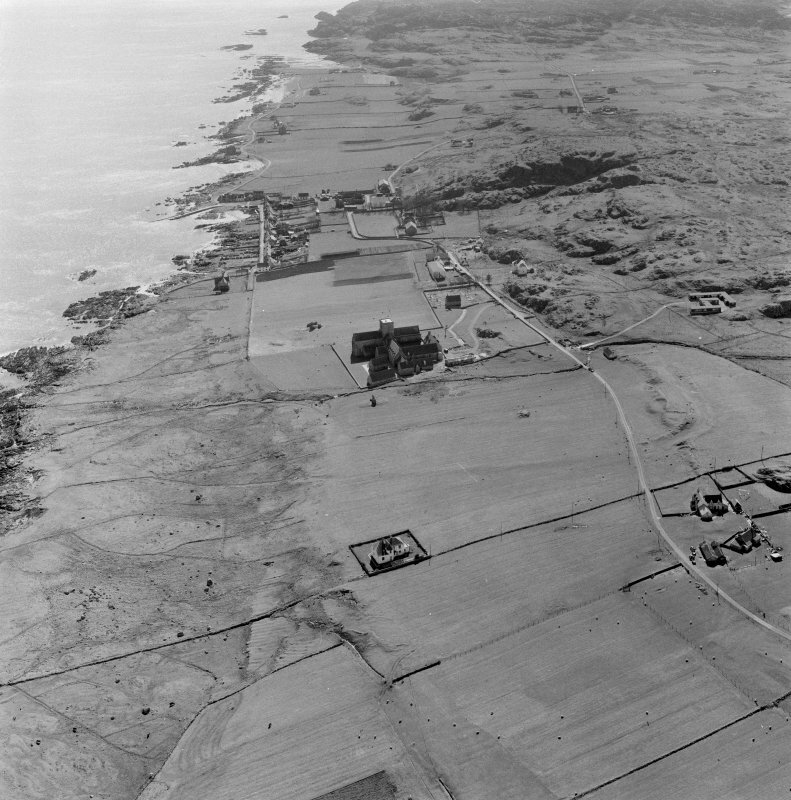 General oblique aerial view of the abbey and village, taken from the SSW. 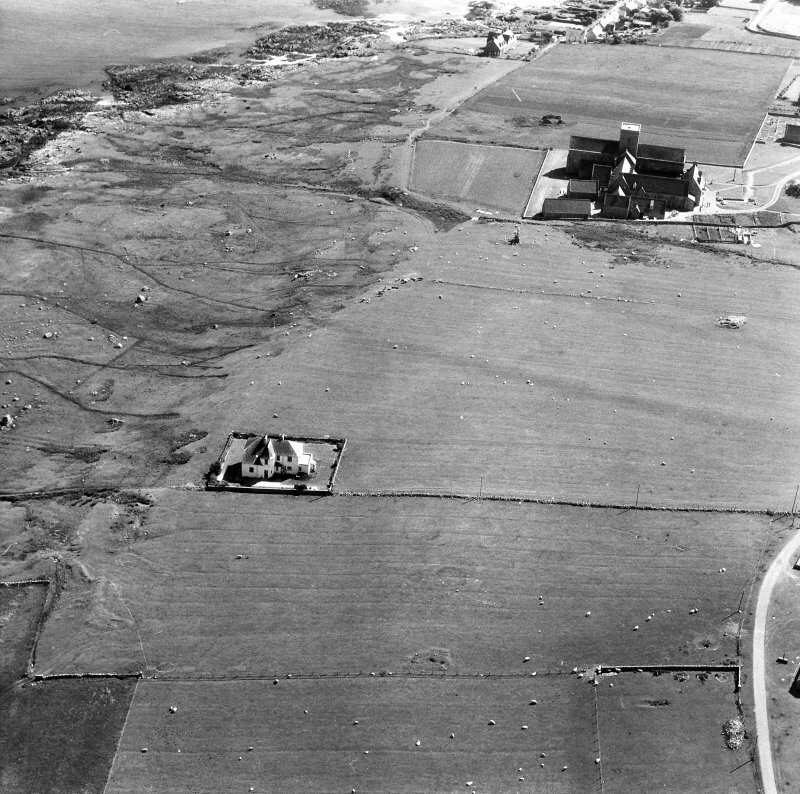 Oblique aerial view centred on the abbey and the remains of the vallum with the house adjacent, taken from the SSW. Oblique aerial view centred on the abbey and the remains of the vallum, taken from the SW.
Plan of West range ground floor and dyeline print with alterations. 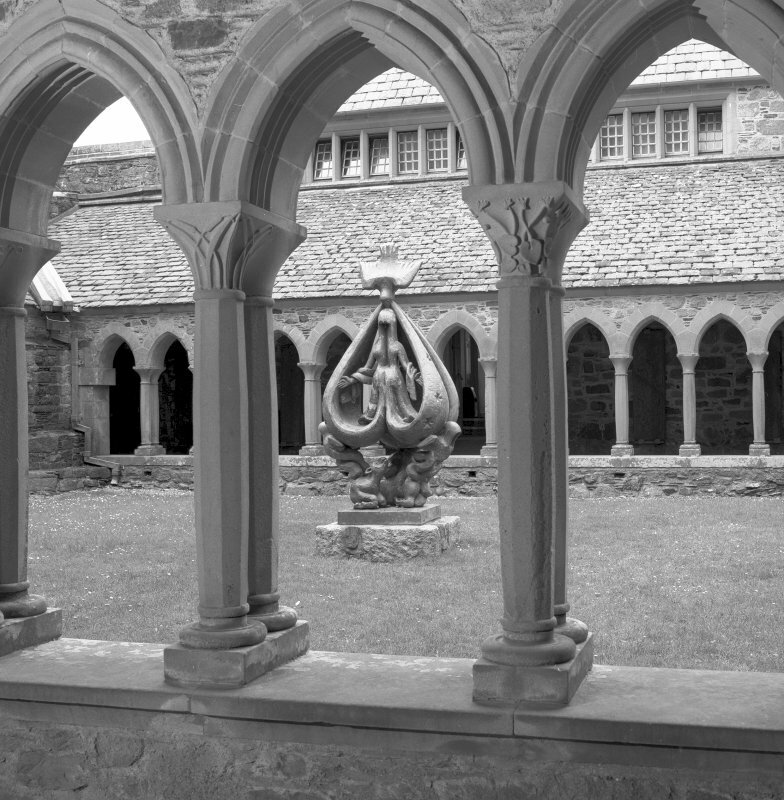 Iona Abbey, cloister. Cloister and statue. 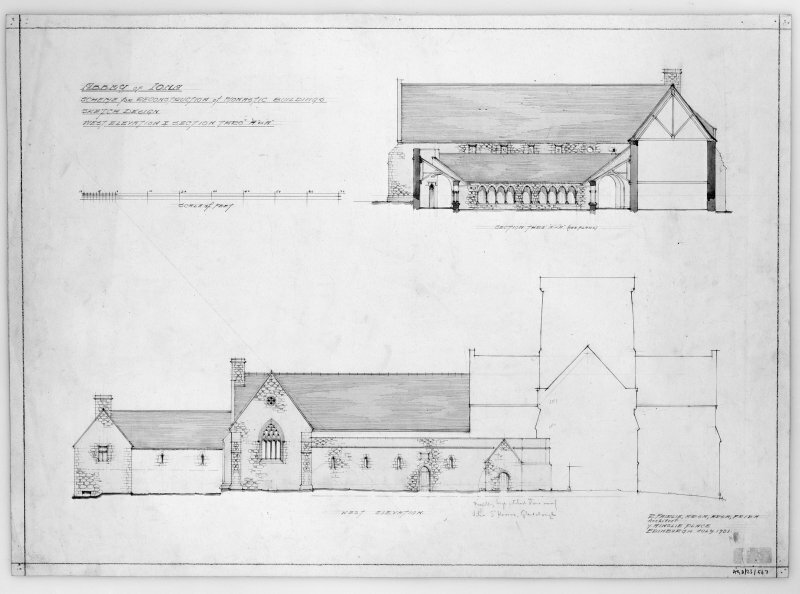 Section and West elevation. Scanned image of AGD 23/567. Iona, Iona Abbey, interior. View of West cloister with sculpture. Iona, Iona Abbey. View from South-West. Iona, Iona Abbey. 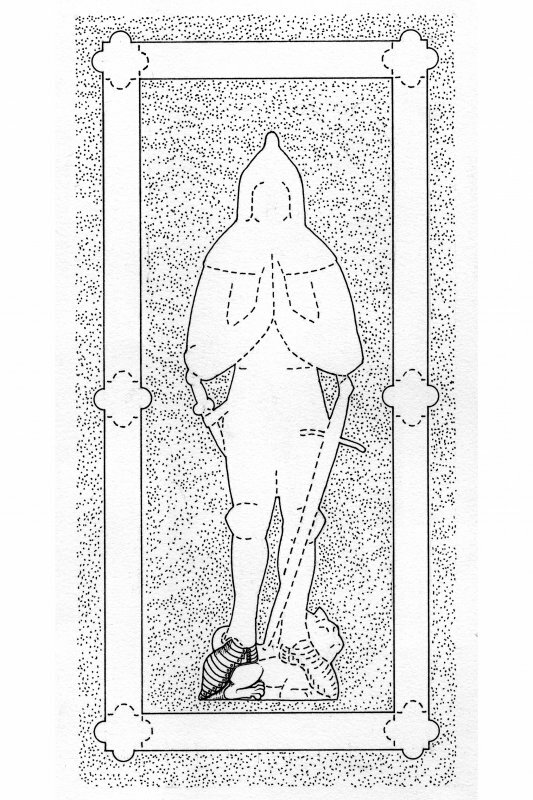 Drawing of monumental brass matrix. 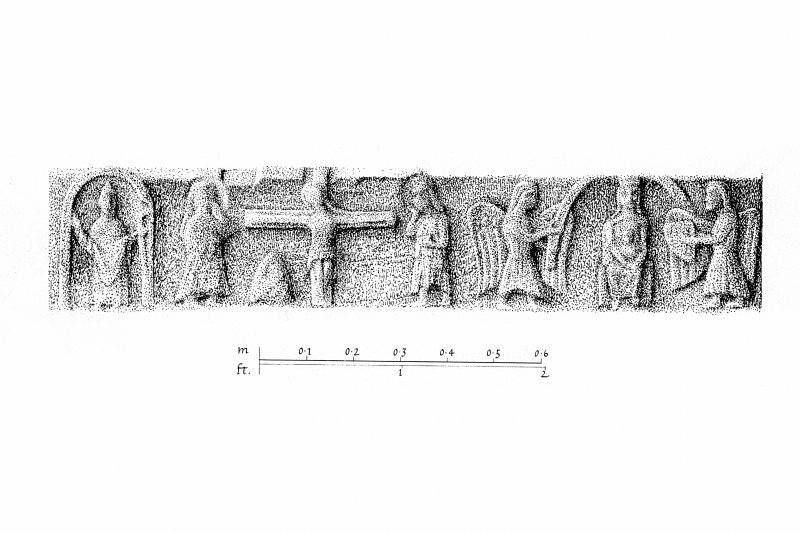 Iona, Iona Abbey Museum. View of contents of glass-topped display case showing all artefacts. Iona, Iona Abbey. Plan of former refectory doorway, partially reconstructed. Iona, Iona Abbey, interior. 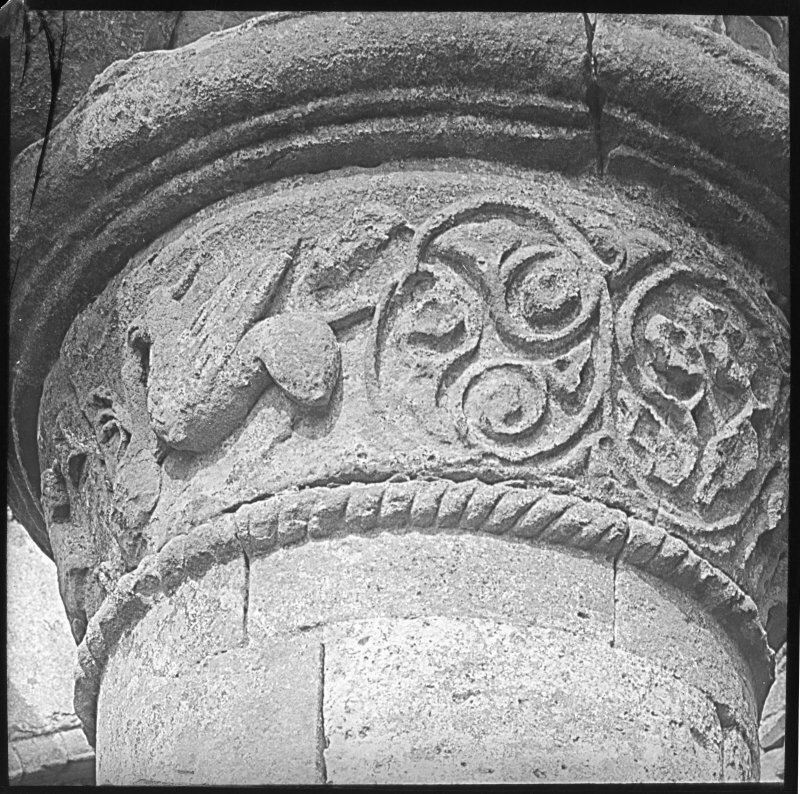 View of chapter house carved capital. Iona, Iona Abbey. View of refectory from South-West during restoration. Iona, Iona Abbey. View of refectory from South during restoration. Iona, Iona Abbey. 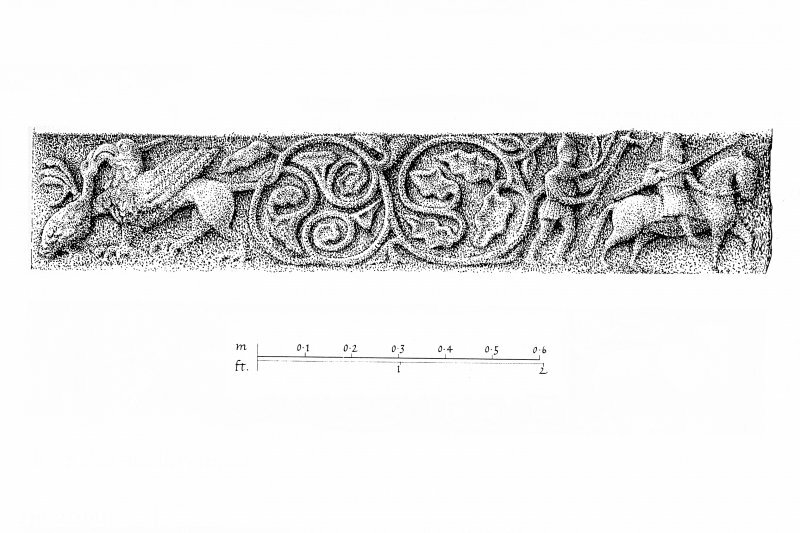 Plan showing details of choir/crossing carved capitals and preparatory drawing for 'Iona Guide'. Iona,Iona Abbey. 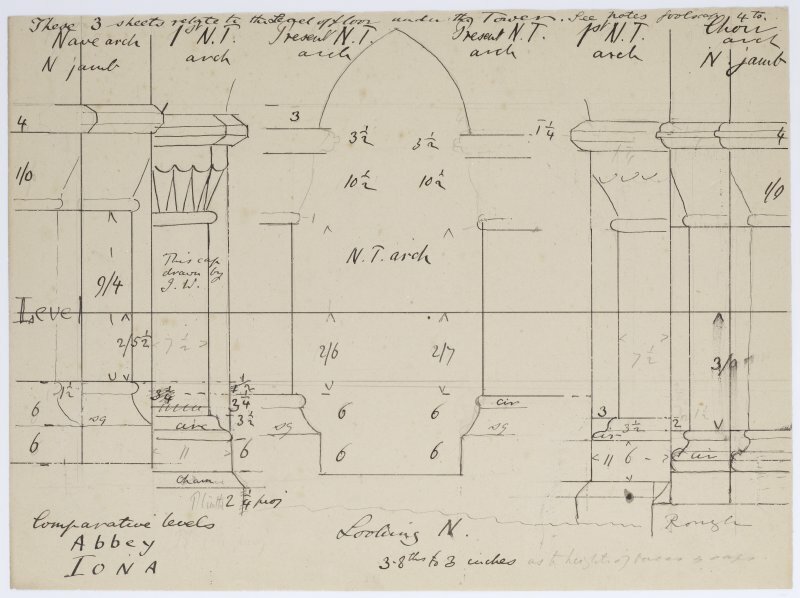 Plan showing details of choir/crossing carved capitals and preparatory drawing for 'Iona Guide'. Iona, Iona Abbey, interior. 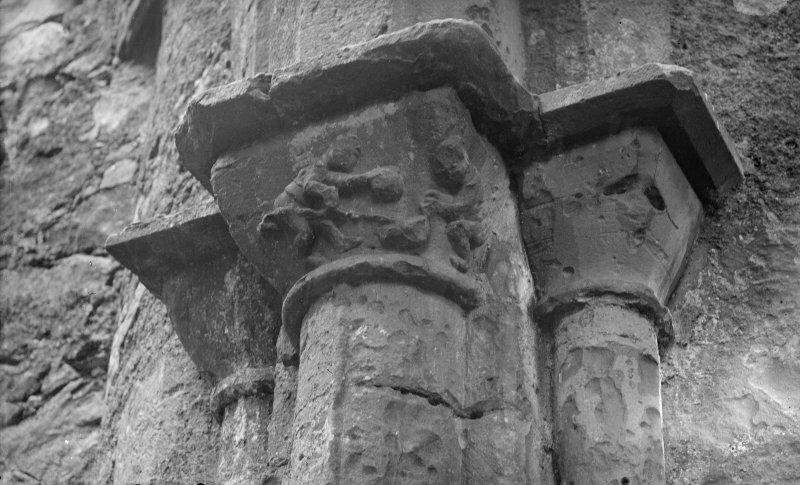 View of choir arcade showinf capital of second column with detail of carving depicting the Weighing of Souls by St Michael who wards off an approaching demon. Iona, Iona Abbey,interior. 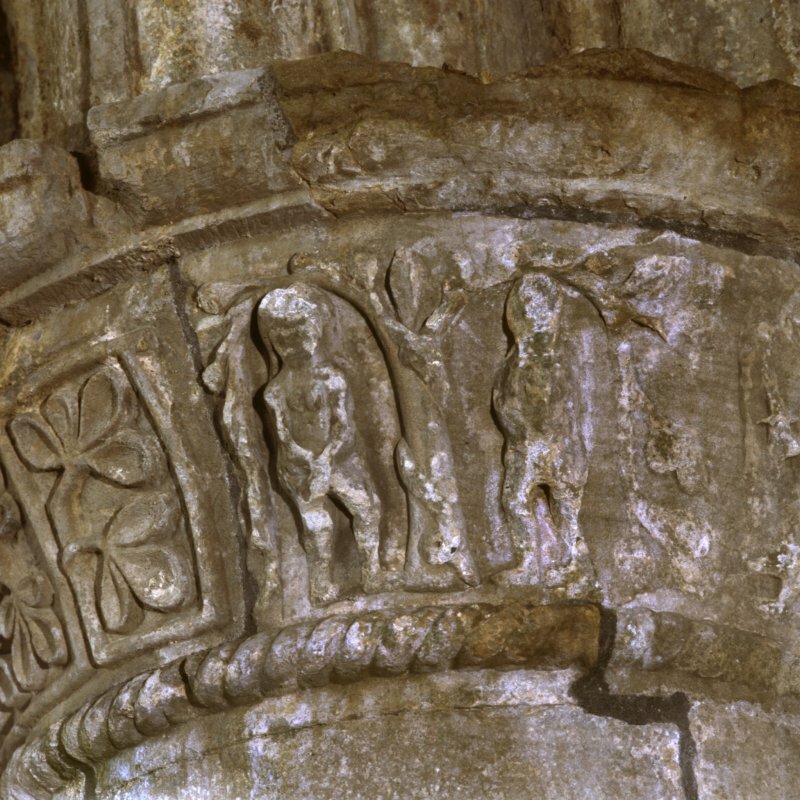 View of choir arcade showing capital of second column with detail of carving depicting demon with ibis or curlew. 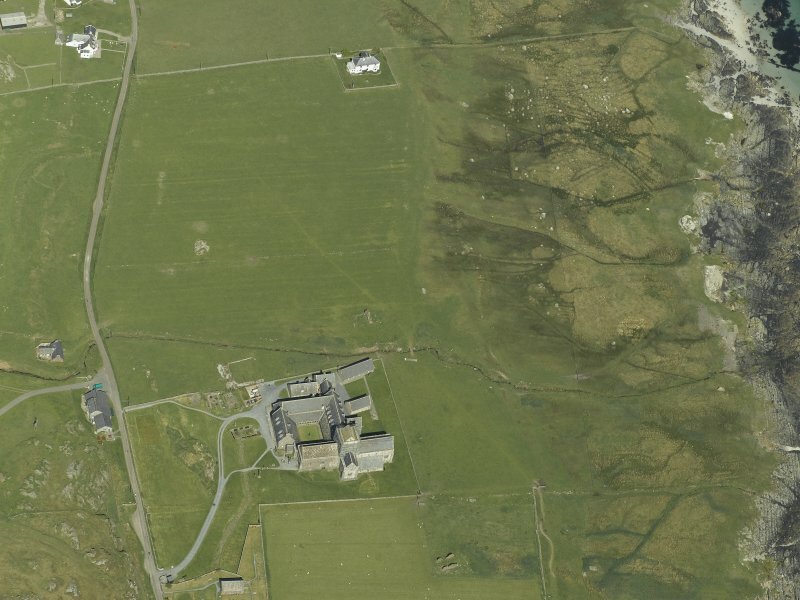 Iona, Iona Abbey & Vallum. General view from North-West. Iona, general. 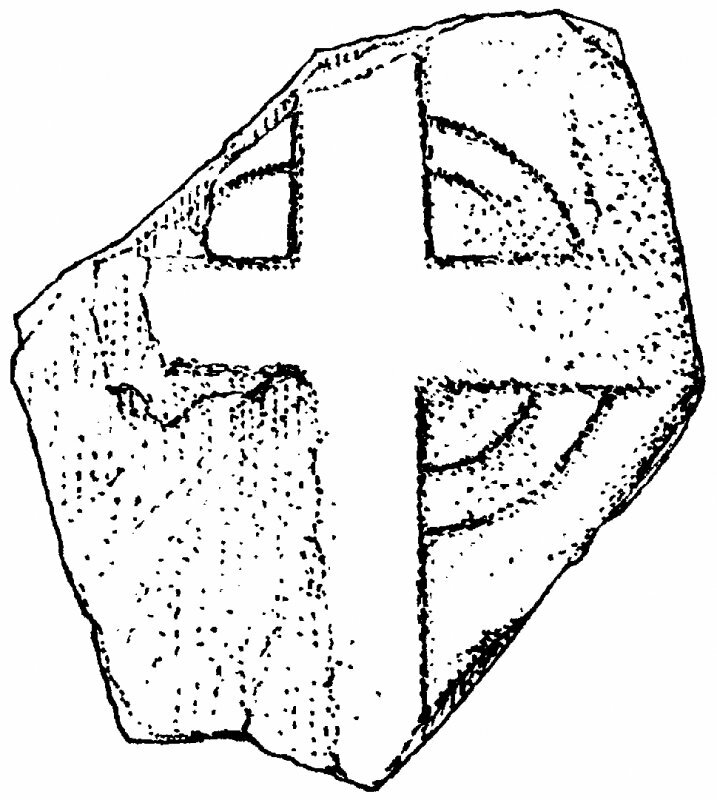 Plan showing outline incised, ringed crosses. Iona, Iona Abbey. 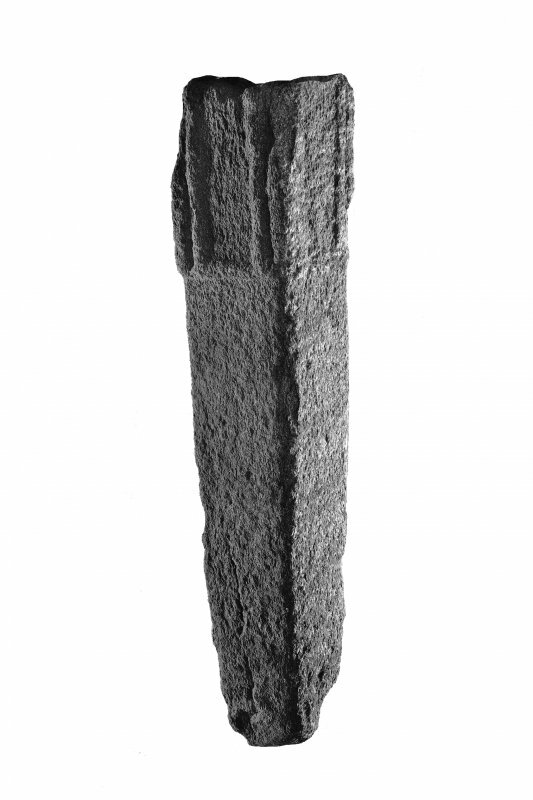 View of effigy Abbot John MacKinnon showing detail of head end. Iona, Iona Abbey. 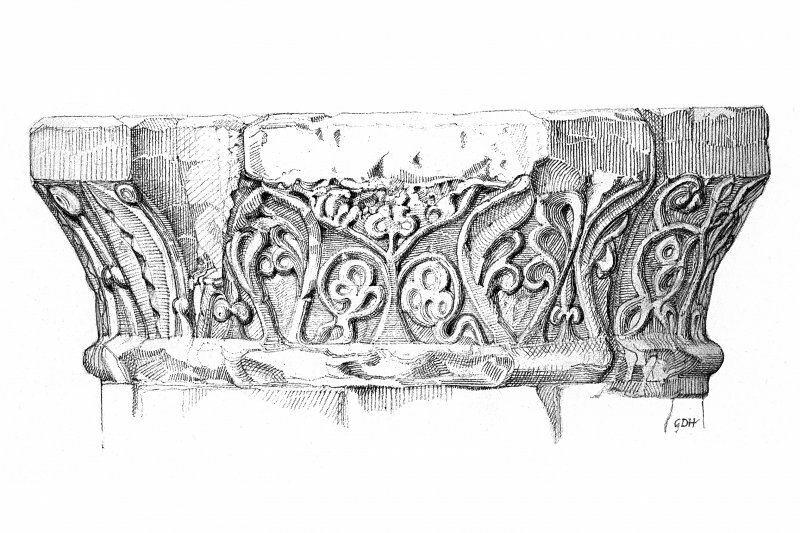 Sketch showing carved capitals of cloister arcade. Iona, Iona Abbey. 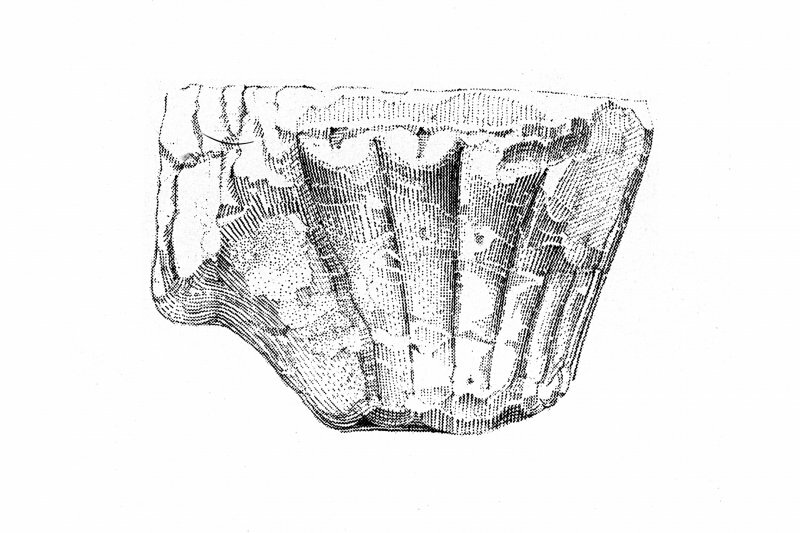 Plan of chapter-house arcade showing detail of carved capital. Iona, Iona Abbey. 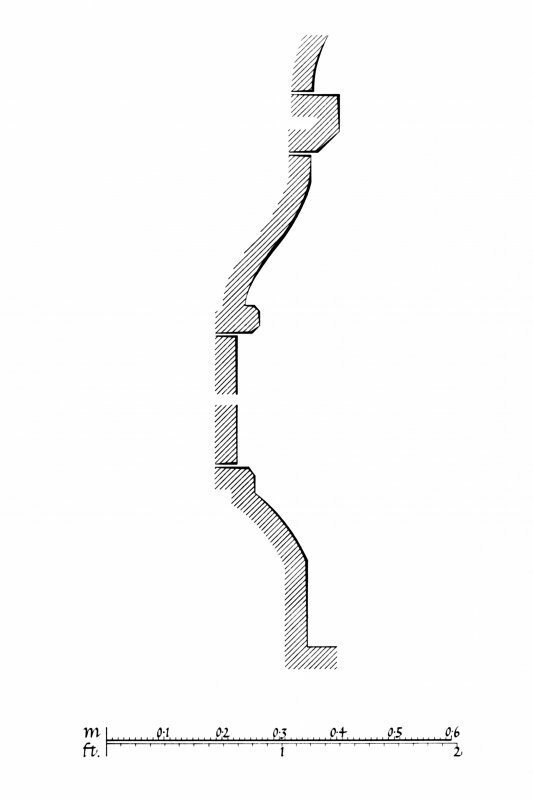 Plan showing chapter house arcade profile mouldings. Iona, Iona Abbey. 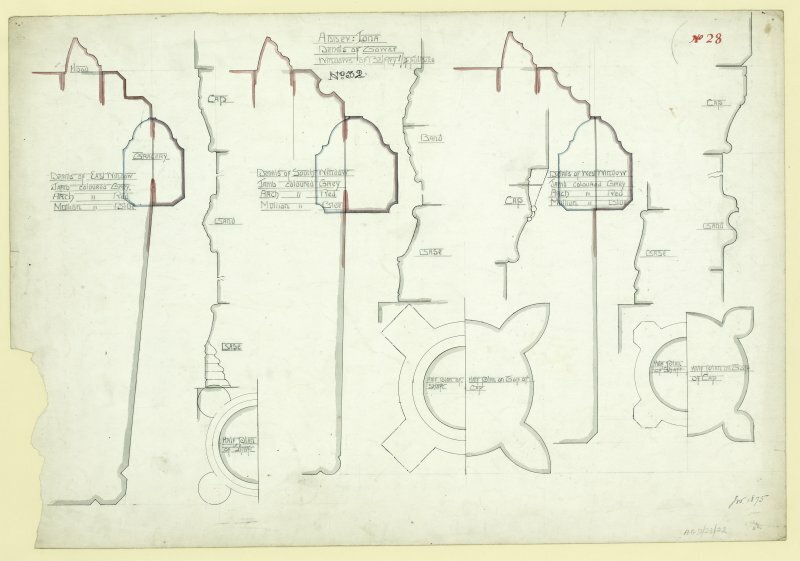 Plan showing cloister of drawings of bases in cloister arcade. Iona, Iona Abbey. 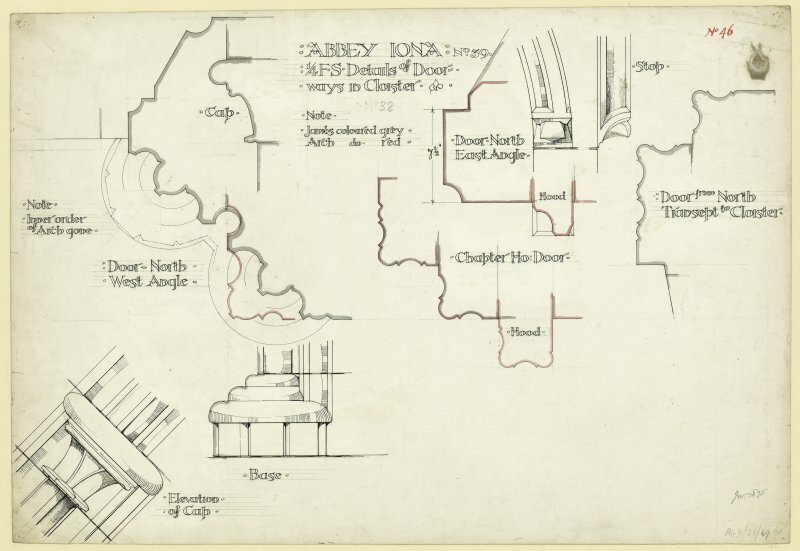 Plan showing profile mouldings of doorway in West wall of North transept; South-West diagonal arch of cloister; entrance doorway of chapter-house & jamb of East window in chapter-house. Iona, Iona Abbey. 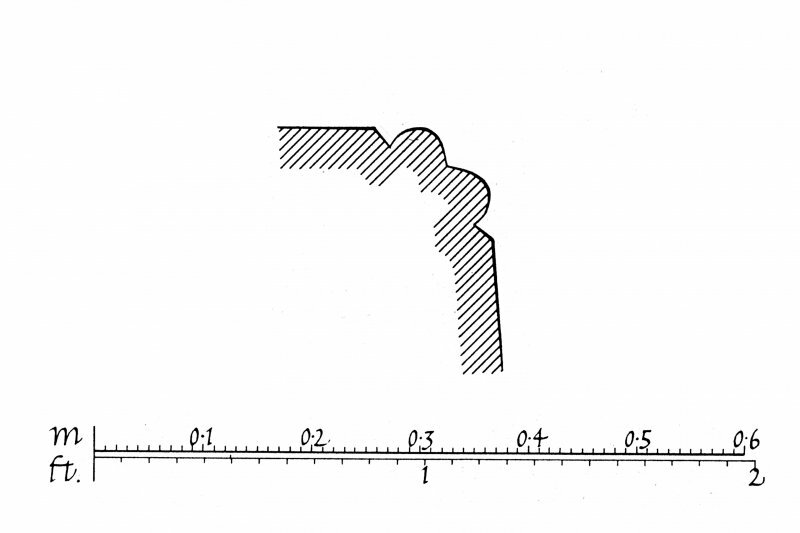 Plan showing profile mouldings of centre window in South wall and West doorway. Iona, Iona Abbey. 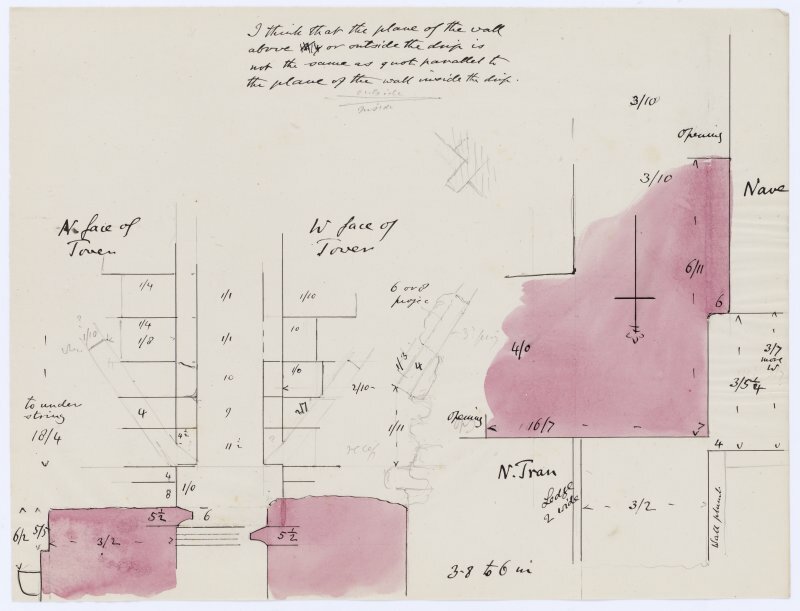 Plan showing profile mouldings of South choir-arcade. 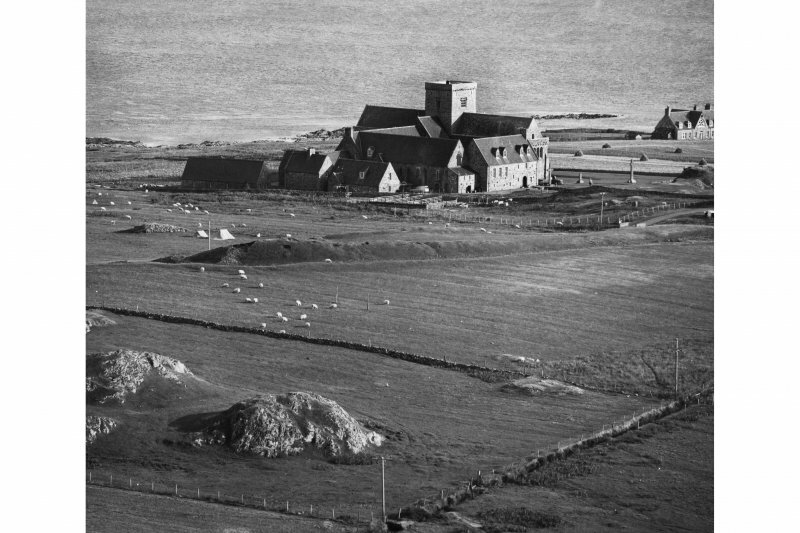 Iona, Iona Abbey. Plan showing South-East transept details. Iona, Iona Abbey. 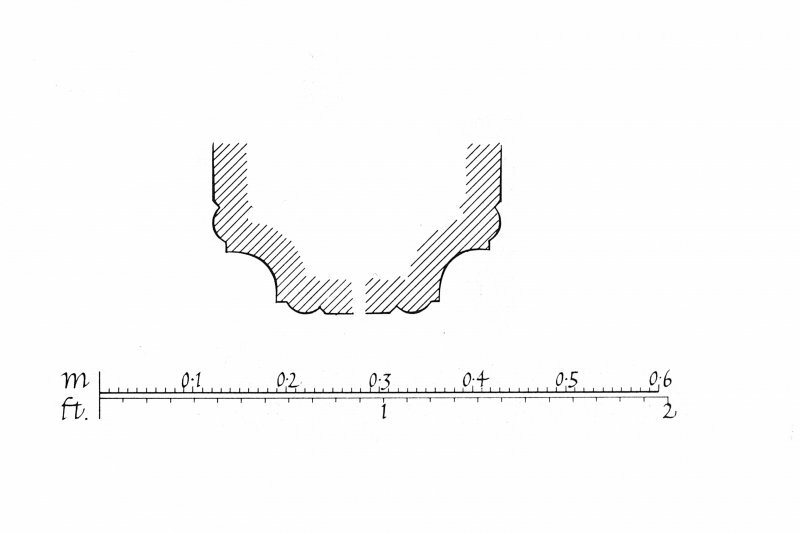 Drawing of profile mouldings. Iona, Iona Abbey. 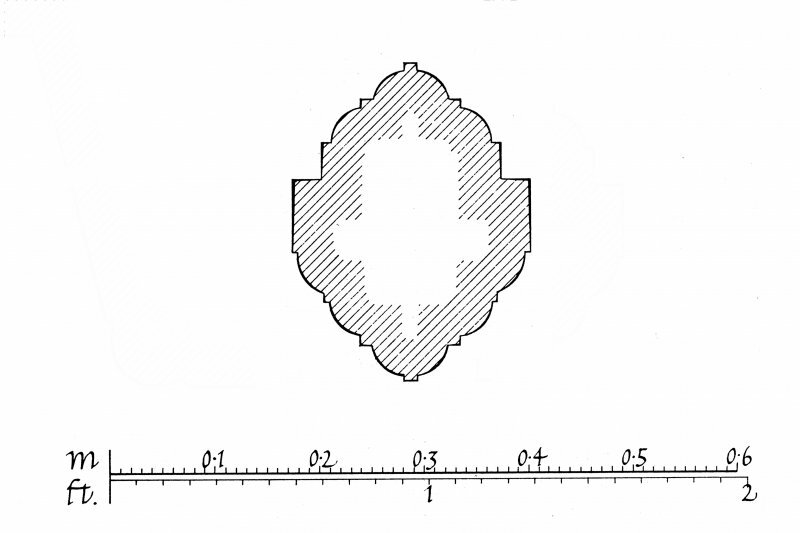 Plan showing profile mouldings of upper East window of choir-aisle. Iona, Iona Abbey. 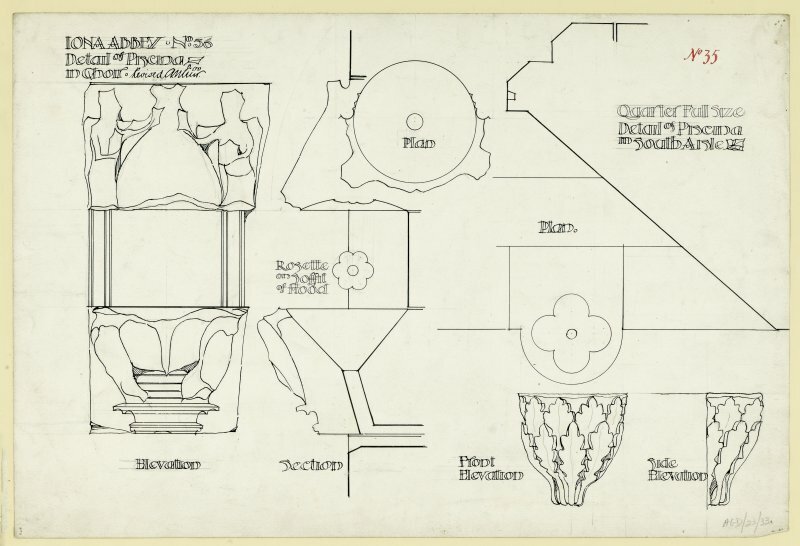 Plan of South transept with South window, profile mouldings of jamb and capital. Iona, Iona Abbey. 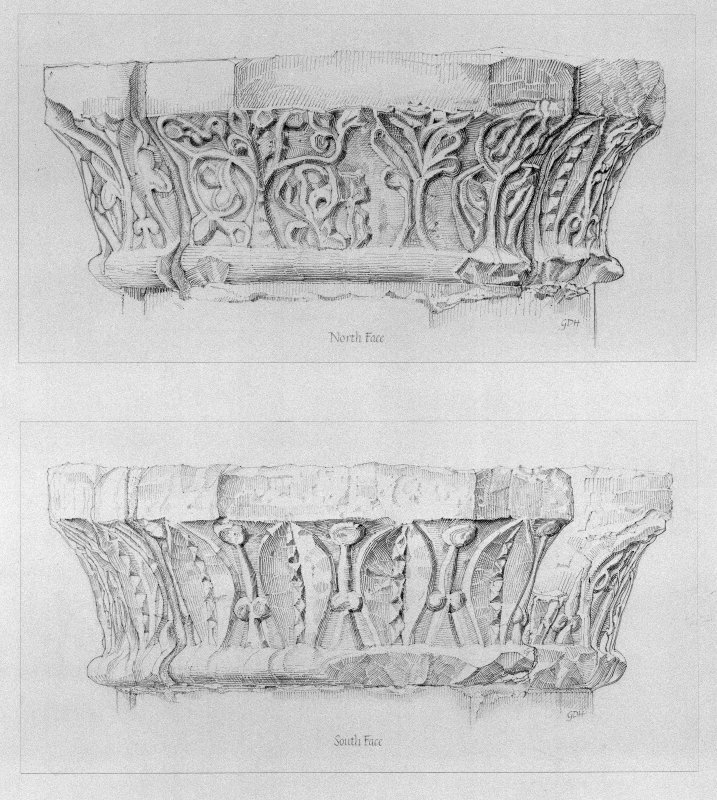 Photographic copy of plan showing profile mouldings of voussoir and North transept. Iona, Iona Abbey. 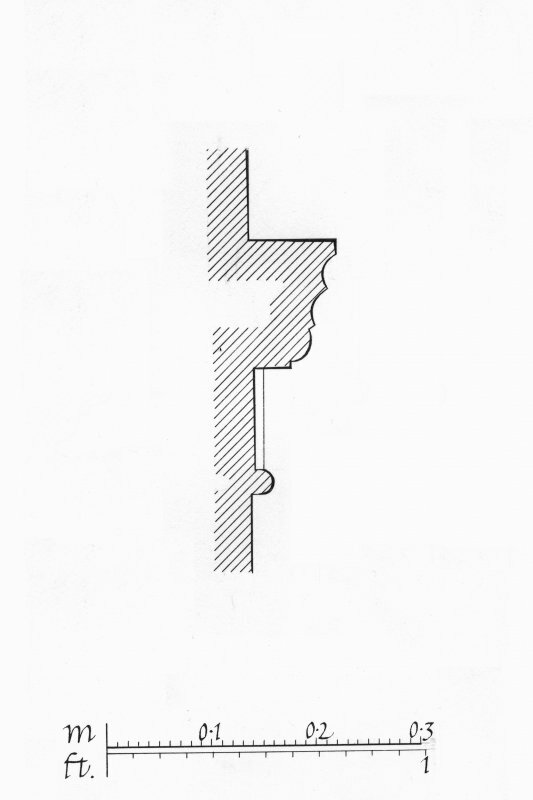 Plan showing sacristy doorway with detail of capital of inner order of West jamb. Iona, Iona Abbey. 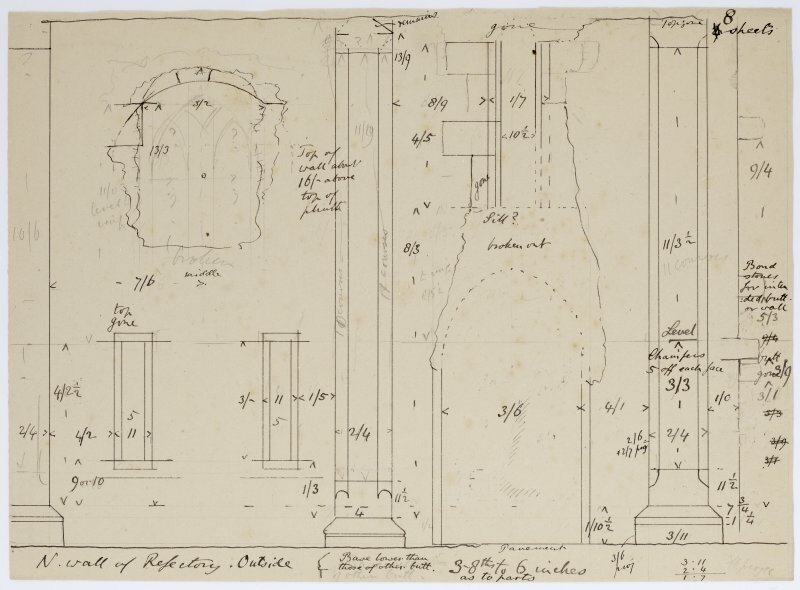 Plan showing perspective view of pedestal in South choir arcade. Iona, Iona Abbey. View of voussoir with keeled moulding. Iona, Iona Abbey. 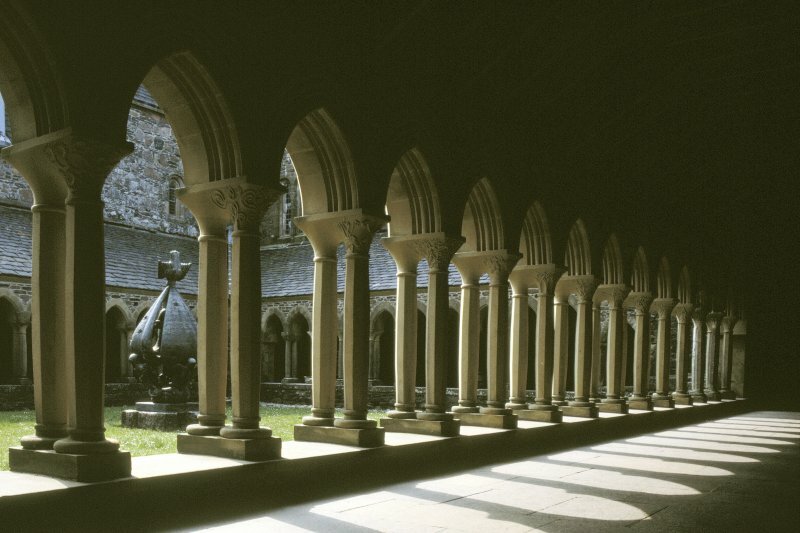 View of cloister from East, prior to restoration work. Iona, Iona Abbey. 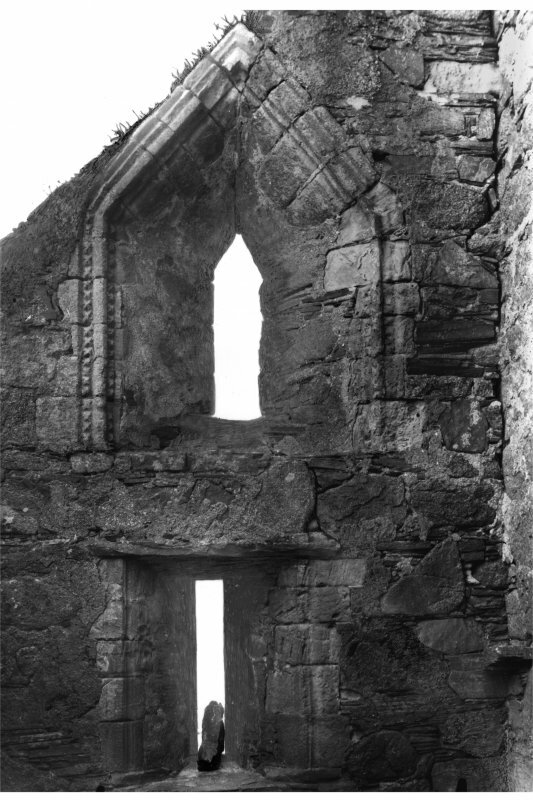 View of window in West wall of tower. Iona, St Mary's Abbey. 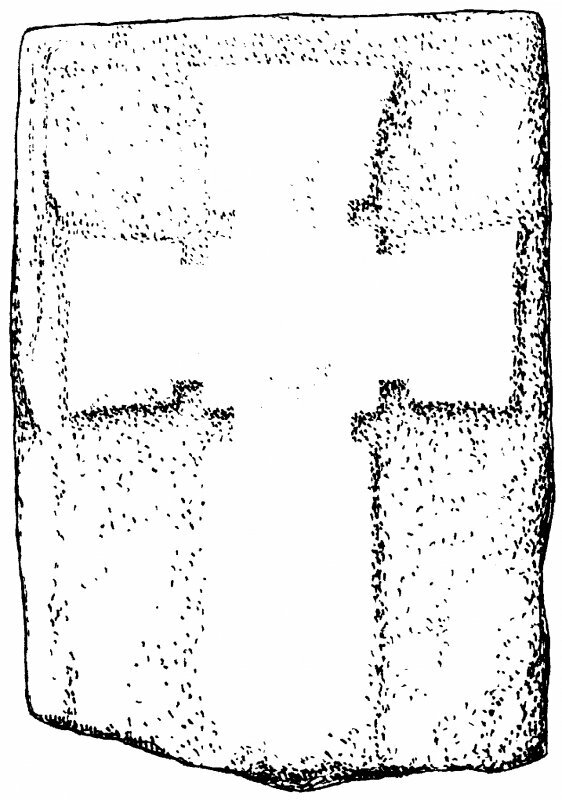 Plan of Mason's marks. Iona, Iona Abbey. Photographic copy of plan showing the development c.1200 AD to 1638. Iona, Iona Abbey, interior. View of sacristy doorway showing capitals on East. Iona, Iona Abbey, interior. View of South window of Choir showing detail of capital on West jamb. 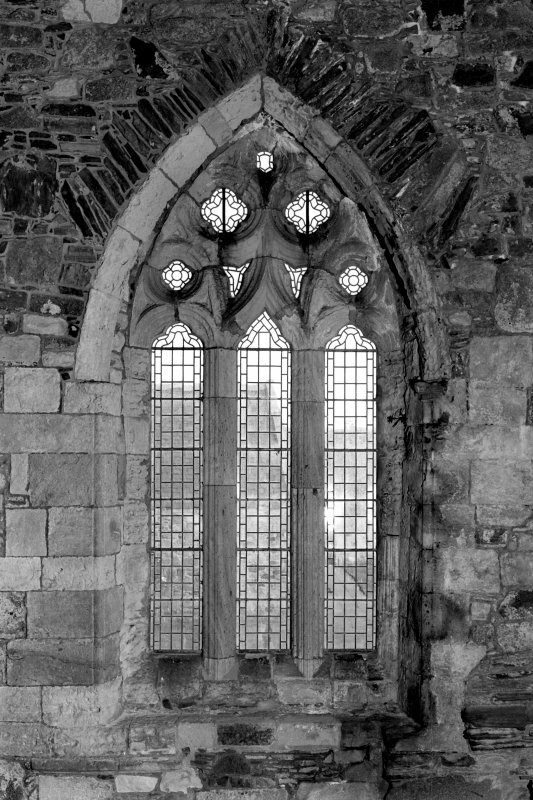 Iona, Iona Abbey, interior. View of choir North window. Iona, Iona Abbey. View of North choir aisle in East wall. 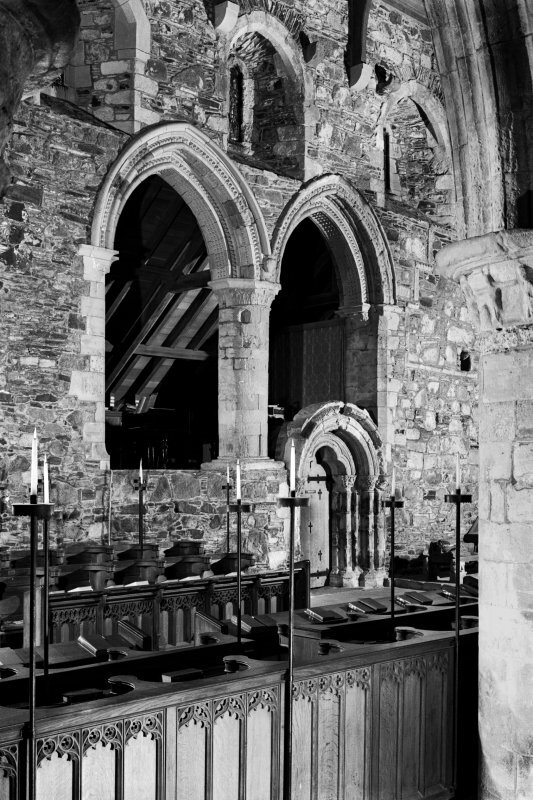 Iona, Iona Abbey, interior. View of sacristy from South choir aisle. 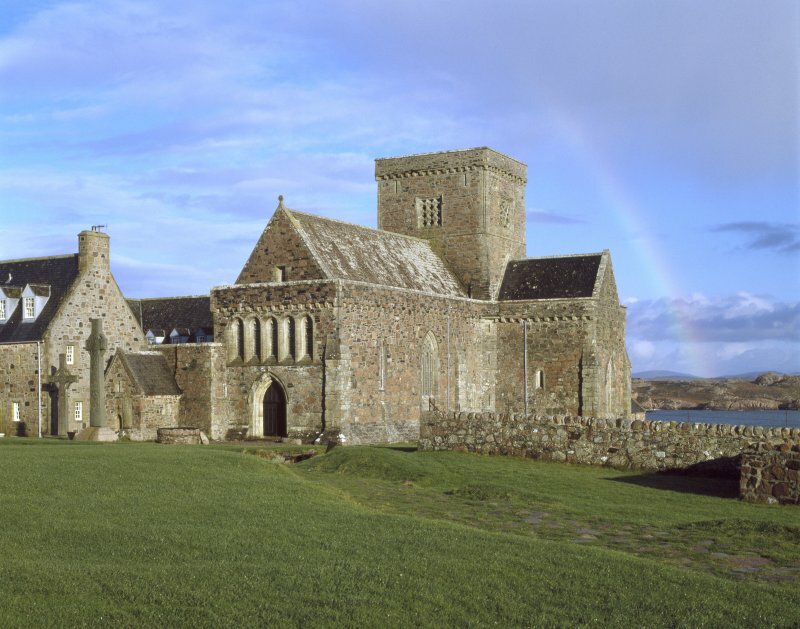 Founded shortly before 1203 on the site of the Columban abbey, the Benedictine Abbey on Iona comprised a church dedicated to St Mary and a monastery dedicated to St Columba. In 1499 the church became the Cathedral of the Bishops of the Isles. Reportedly damaged by a reforming mob in 1561, by the end of the 17th century the abbey had fallen into ruins. 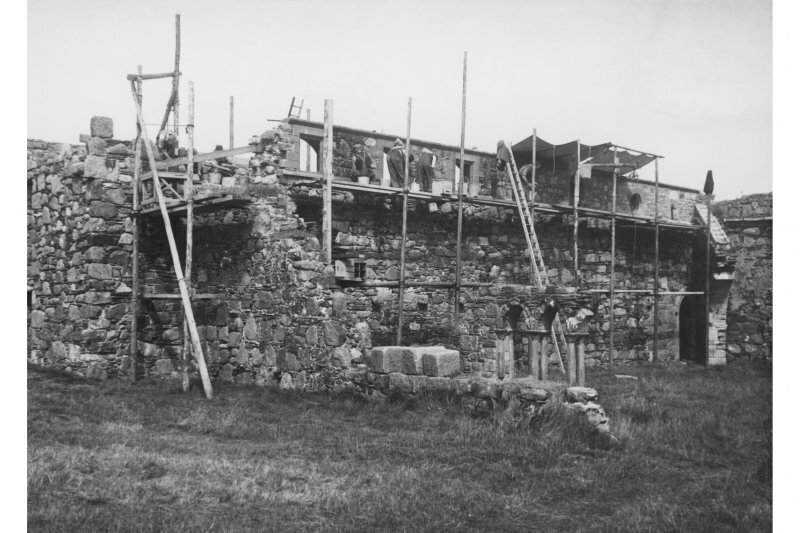 Restoration work began at the end of the 19th century and, in 1938, the newly formed Iona Community took over the running of the abbey. For coin hoard found in Iona Abbey (NM 2865 2451), see NM22SE 2. 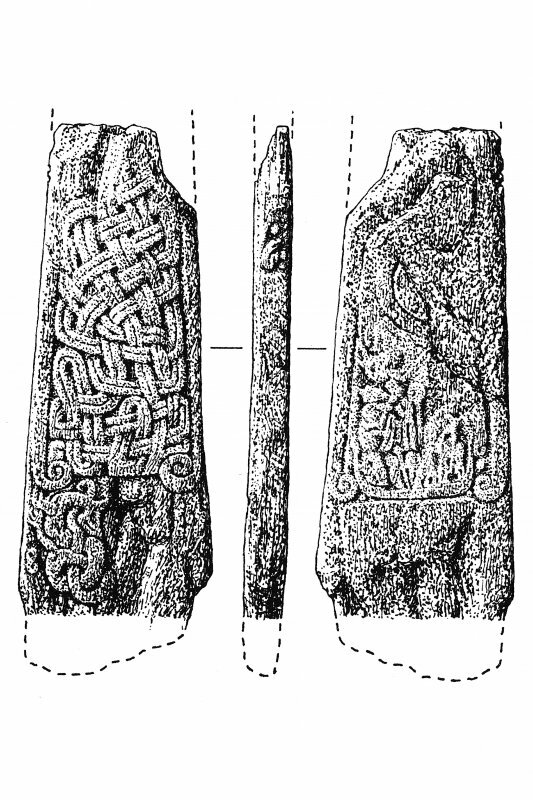 For Iona, Early Christian Monastery (NM 286 244) and related crosses, see NM22SE 4.00. For Iona Nunnery (NM 2843 2410), see NM22SE 14. A modern restoration of the Benedictine Abbey whose church became the Cathedral of the Bishops of the Isles in 1499. The Abbey was founded before 9th December 1203 when a papal letter confirmed its possessions to the abbot and convent. 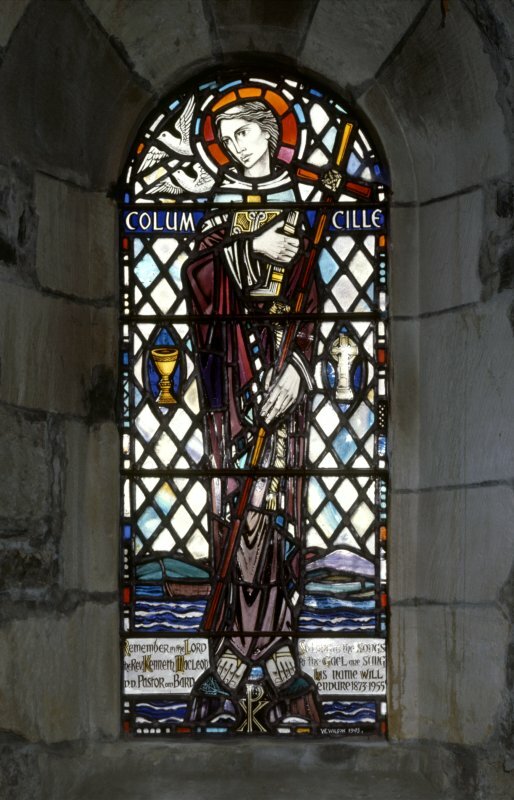 The monastery was dedicated to St Columba - as witness a papal letter of 1247 addressed to "the abbot of the monastery of St Columba of the order of Saint Benedict" - and the church to St Mary. It is said to have been damaged by a reforming mob in 1561 and by the end of the 17th century, the buildings were in ruins. Since the end of the 19th century, the whole complex has been restored, first by the Duke of Argyll and since 1938 by the Iona Community. The abbey is unusual but not unique in having its monastic buildings to the north of the church, presumably because of the water supply, and in having three detached buildings. Those on the east - now the Michael Chapel (NM 2870 2451) and the Museum (NM 2871 2453) - may have been a chapel and the infirmary while that on the west (NM 2564 2452) was the Old Guest House. The church shows evidence of alterations and additions but since all are made with the same type of red granite they are difficult to date. A suggested building history could be a Romanesque church built about 1190, an eastern building or additon in the 13th century, a rebuilding or enlarging about 1420 and a final refurbishing about 1500. 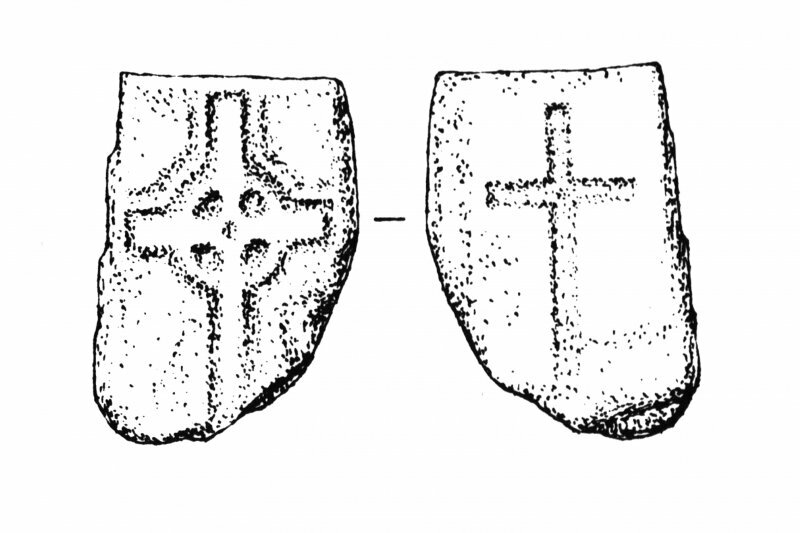 An added complication is the fact that the lines of a cruciform church, smaller and earlier than the Abbey, underlie it and may date from the late 12th century. The square precinct wall of the Benedictine monastery has been defined by excavation. It ran between the monastery and Tor Abb and a gateway was exposed with Sraid nam Marbh running through. Thomas says it was essentially that which stood until about 1860. As described. No definite trace of the precinct wall could be found although a wall running S from the "Guest House" may represent the remains. Limited excavation took place while a hole to house the underground plantroom for a new heating system was machine dug to the E of the Abbey. 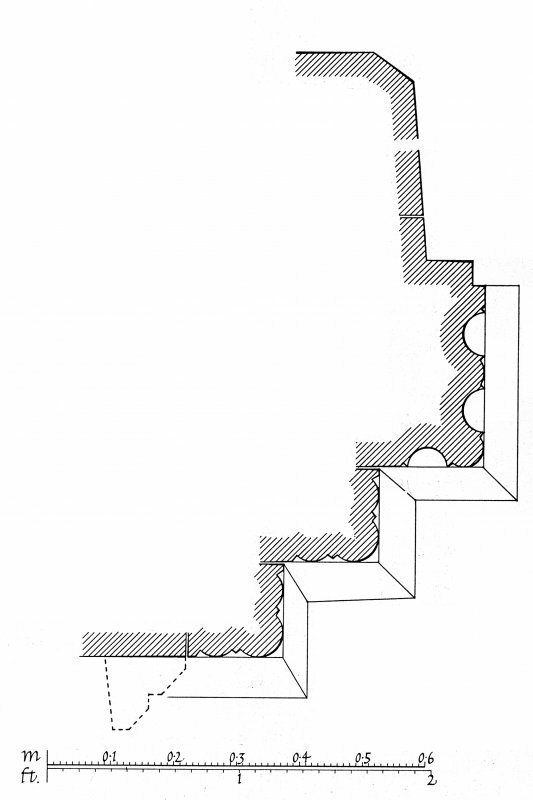 Layers and features, including a stone-linked drain, were noted and sampled. Finds of pottery, iron and animal bone were made. NM 286 245 (Abbey); NM22SE 14 (Nunnery) Resistivity and geophysical surveys were undertaken at Iona Abbey and Nunnery (see NM22SE 14) by Geophysical Surveys of Bradford for AOC (Scotland) Ltd.
At the Abbey, several magnetic and high resistance anomalies correspond to known features (walls, paths or service structures). Other high resistance anomalies S and E of the Abbey complex, form clear linear traces and may correspond to buried drains. 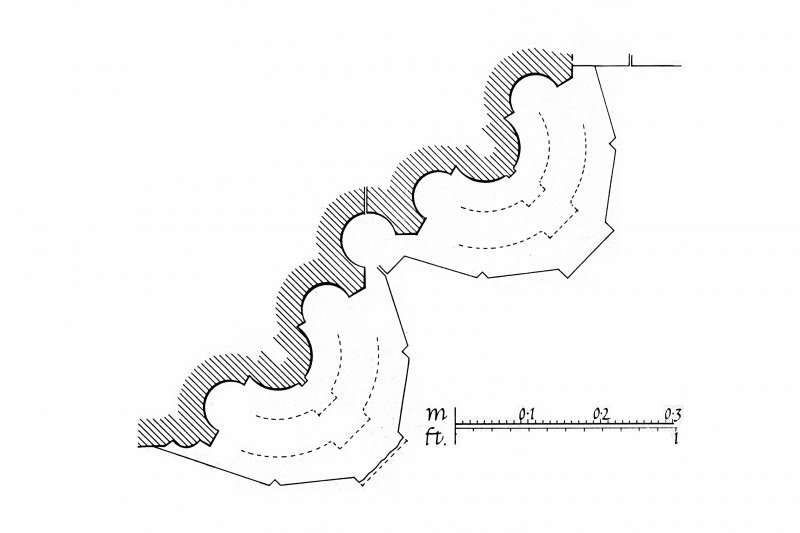 A group of weakly-defined, linear, high resistance anomalies forms a rectilinear pattern within the NW angle of the present boundary wall. The appearance of these features is of buried walls, but they may simply be drains or garden features. 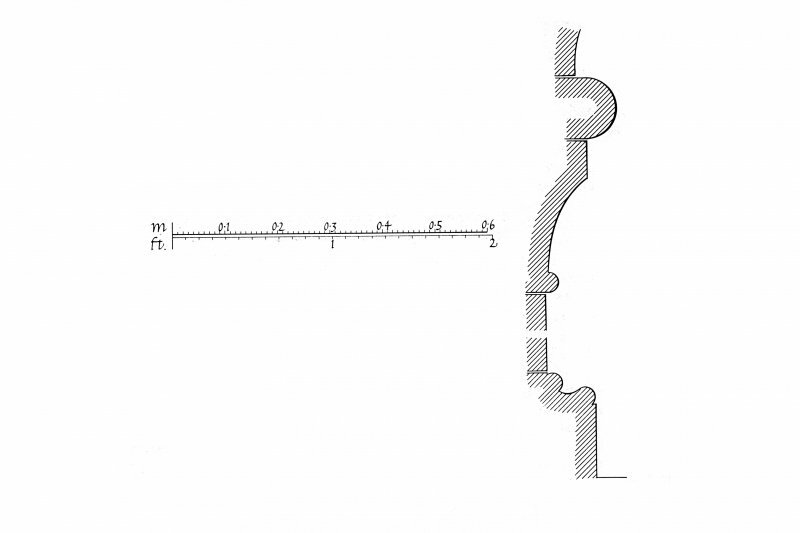 There is no obvious continuity between features identified in the environs of the Abbey by these surveys and features to the S of this area which were identified by an earlier resistivity survey conducted by the Royal Commission (RCAHMS 1981). 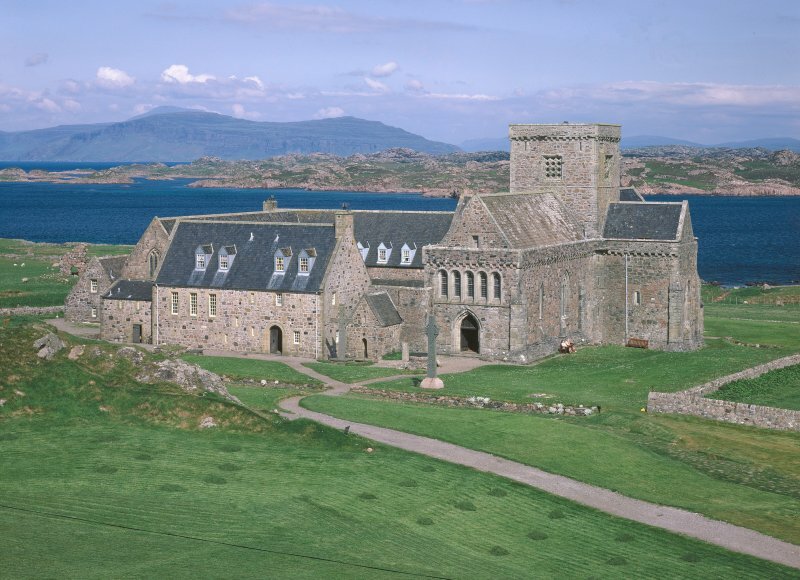 Sponsor: Iona Cathedral Trust Ltd.
NM 286 245 An assessment was undertaken at Iona Abbey in September 2002 in order to advise on potential damage to archaeological features in advance of disabled access being constructed. Three trenches were excavated: two within the main entrance passageway, and the third to the E inside the abbey. The trenches were excavated down to archaeologically significant features but did not remove them, thereby giving an indication of the depth of material that could be safely removed during the construction. Archaeological monitoring was undertaken in July 2004 during the partial demolition and reconstruction of a disabled access ramp into the cloisters. The ramp consisted primarily of the existing underlying rubble used to construct the former stepped access, running E-W from the main entrance and terminating at the cloisters. No finds of archaeological significance were made. See also NM22SE 5 01 and for replica NM22SE 4 05. 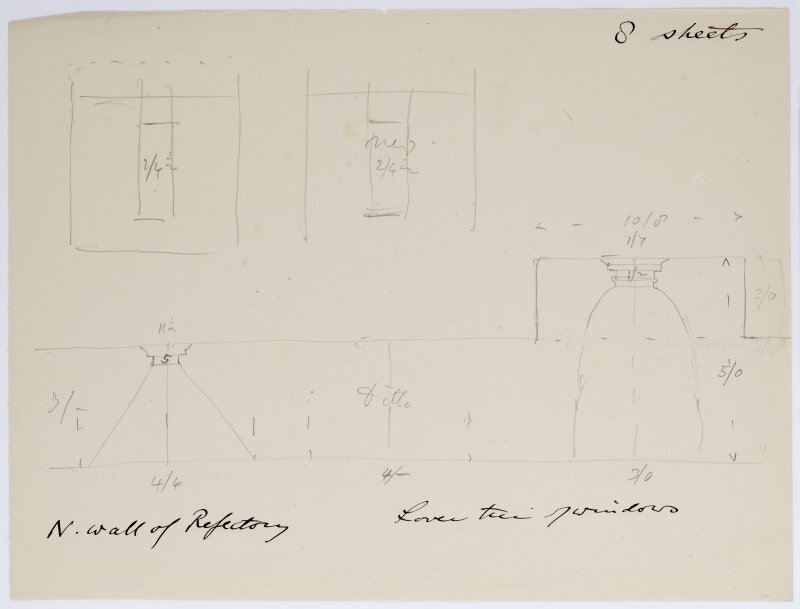 IG Lindsay Collection, 29 - early drawings. Information from Brian Edwards, Old Schoolhouse, Causewayend. Kirknewton, 17/2/1986. 'I regret very much to say that the idea of doing something of the same kind (as at Dunblane) at Iona has been abandoned. I feel that you may regard this rather as a matter of congratulation but in that I think you are entirely mistaken. 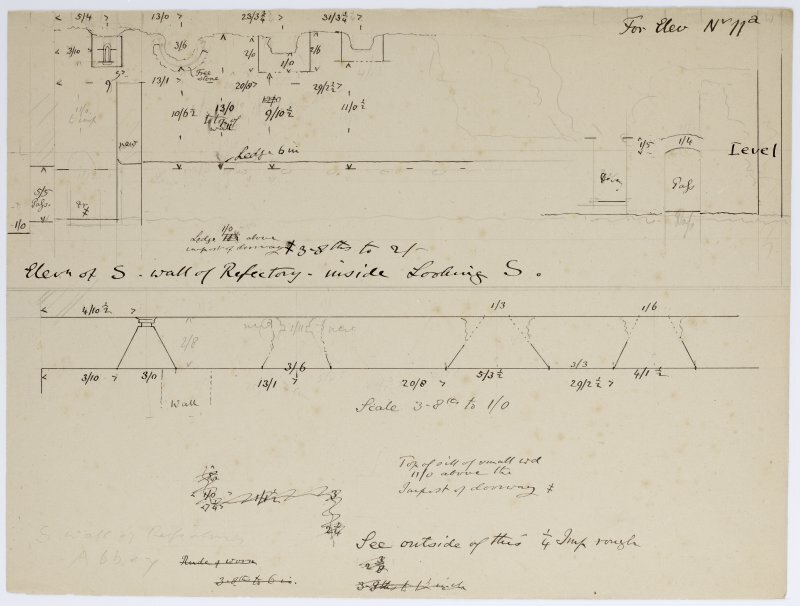 The style of the drawings (especially AGD/23/634) suggests that if anybody helped Honeyman it may well have Sandy MacGibbon whose article on Iona appeared in 'The Builder' in 1893 (pp336-40). 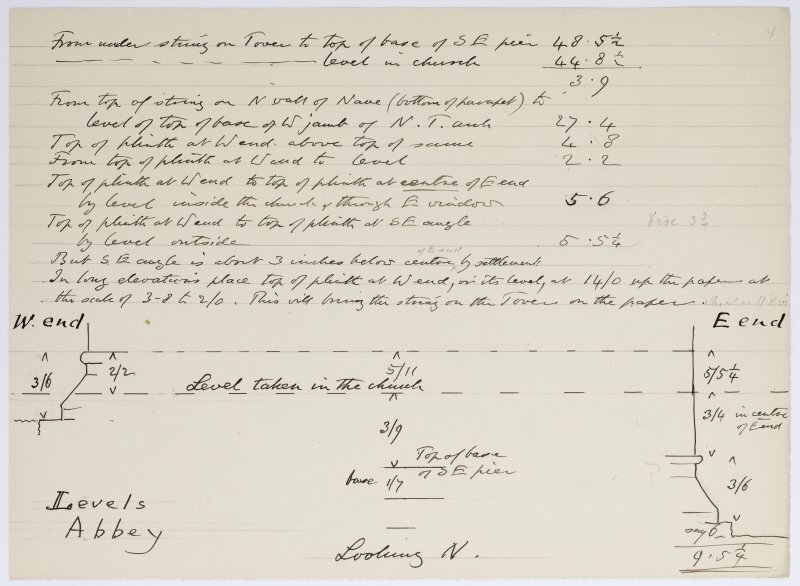 I know Chalmers prepared plans much later (1908) but I think three 1891 plans were produced by Honeyman or at least under his direct guidance. John Honeyman was the Glasgow correspondent of SPAB from 1878-1891 and almost the society's sole Scottish member. 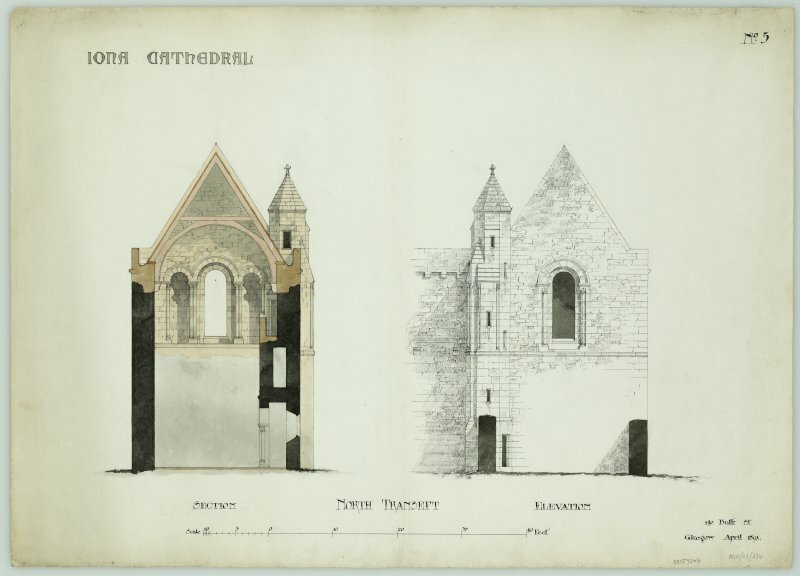 His observations on Scottish cathedrals undergoing restoration are of much interest and figure largely in my PhD thesis presently in preparation. National Art Survey of Scotland survey of Iona Abbey. 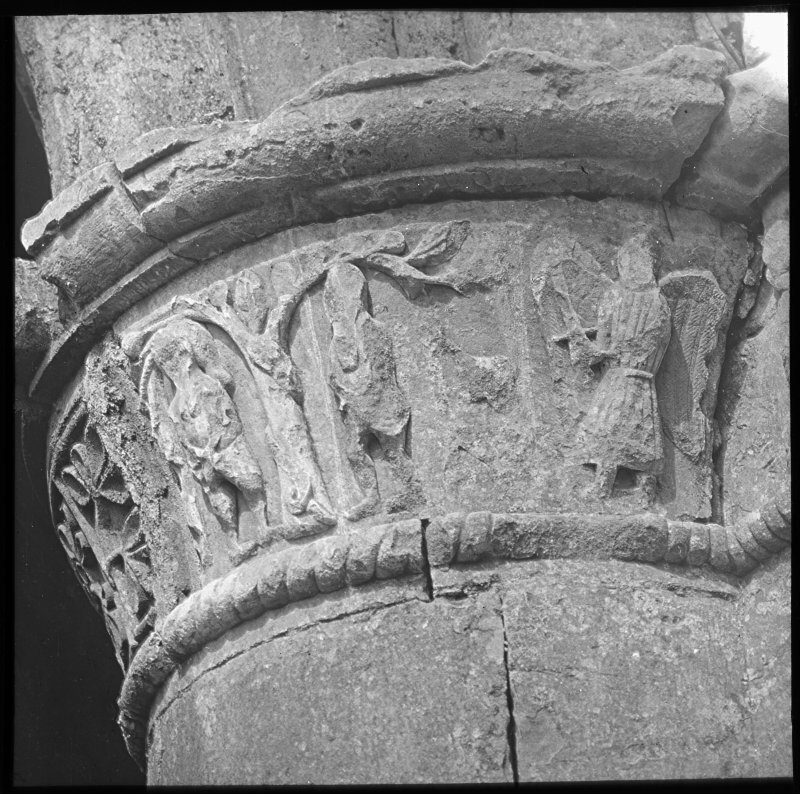 Photographs taken by the architect Ian G Lindsay on visits to the Abbey. 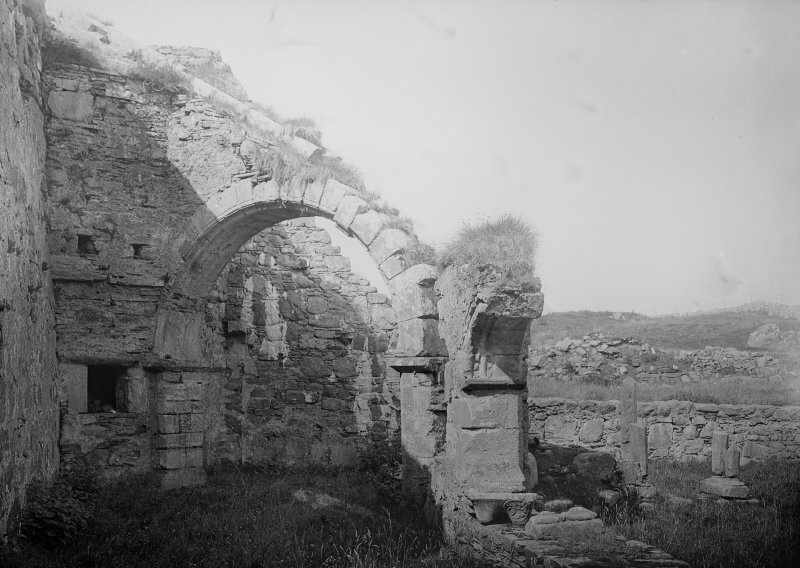 Includes photographs taken during restoration of the Abbey. 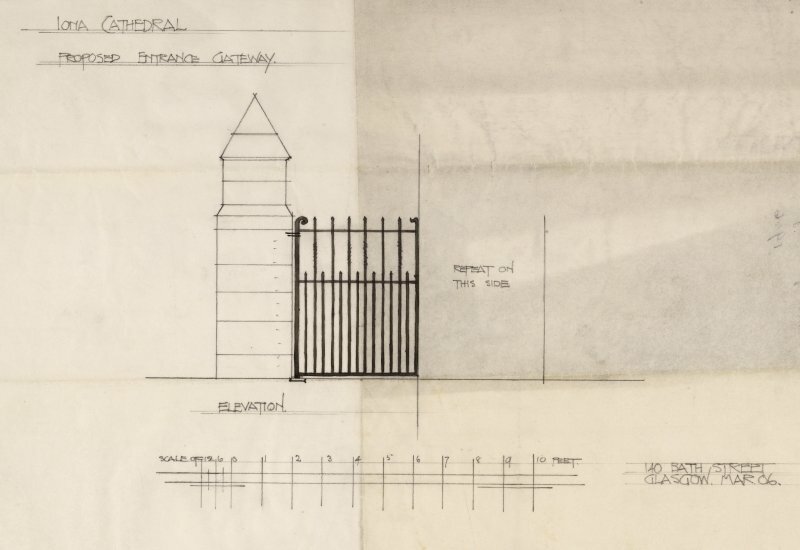 In co-operation with the RCAHMS, a series of trenches were excavated around the abbey church to test certain points and difficulties of the interpretation of the restored Benedictine buildings. 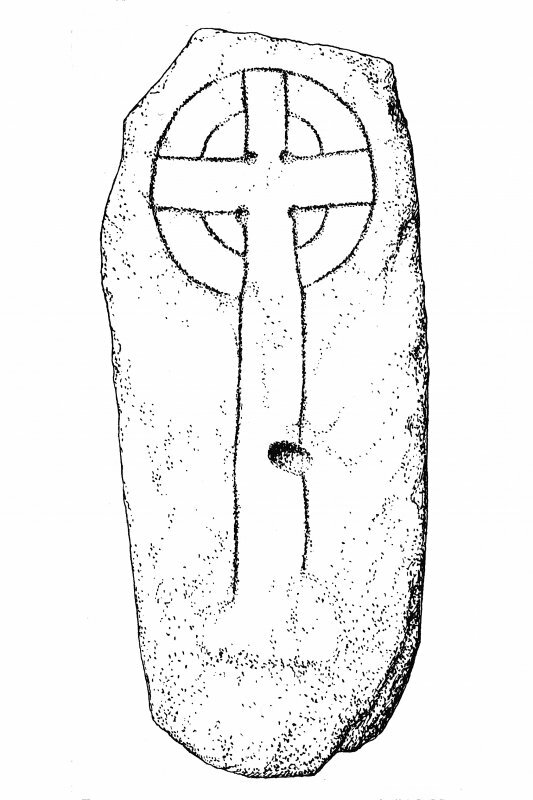 Excavated by John Barber in 1979. Source: J W Barber 1982. Photography for the HMSO Iona Guidebook. Kirkdale Archaeology were asked, under the terms of the P.I.C. 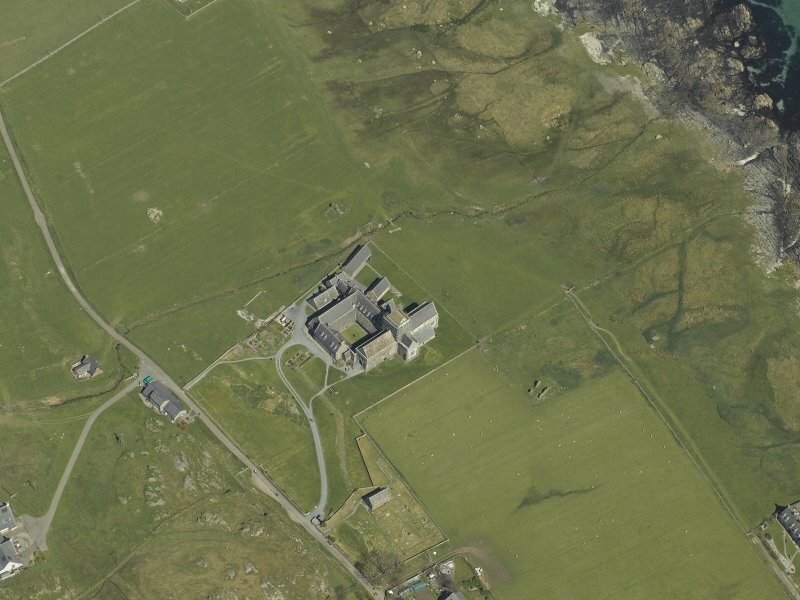 call-off contract, to monitor the excavation of a cable trench near Iona Abbey. The trench, to be dug by hand by the Historic Scotland squad, lay to the W of the Abbey, following the line of the road, and ran from an existing substation to the Abbey ticket hut. The work involved such limited disturbance, in an area probably already disturbed by the road construction, that nothing of archaeological significance was noted. NM 286 245 (centred on) A watching brief was maintained on 8 November 2010 during the excavation of seven small holes for permanent survey markers. None of the holes were deep enough to disturb significant archaeological deposits. NM 28683 24515 This large and impressive collection of carved stones is stored in various locations, with the stones assessed during October 2010–January 2011, kept at the St Columba Centre, Fionphort and in the chapel of St Ronan’s on Iona. A substantial group of stones come from the Nunnery cloisters, so their storage location in St Ronan’s is appropriate. 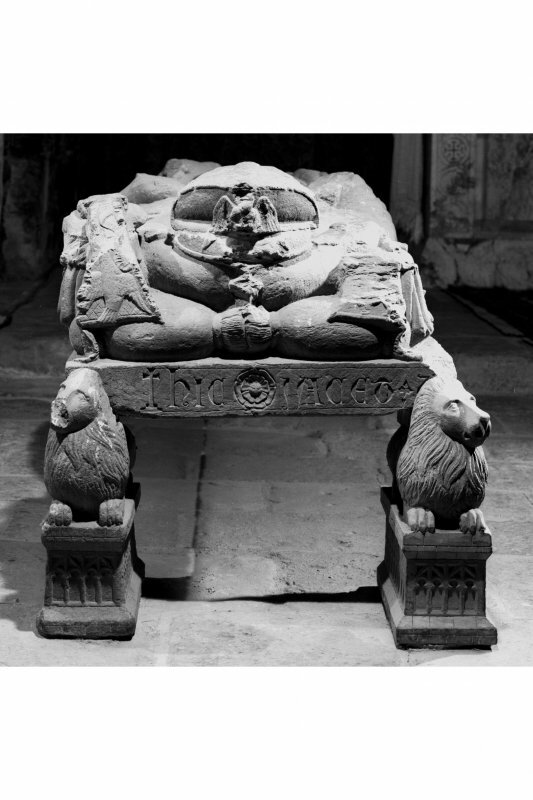 The stones consist of a number of voussoirs, one with low-relief carved decoration. In addition, there are two very highly decorated rectangular blocks, now at Fionphort. Since nothing remains of the nunnery cloisters, the stones are the only evidence of their original appearance. 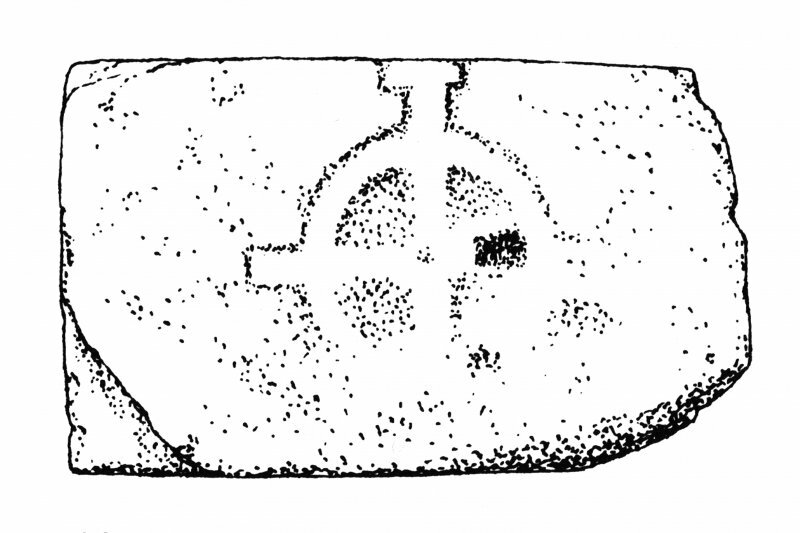 Three of the stones have been described and illustrated in RCAHMS Argyll, vol 4, Iona. 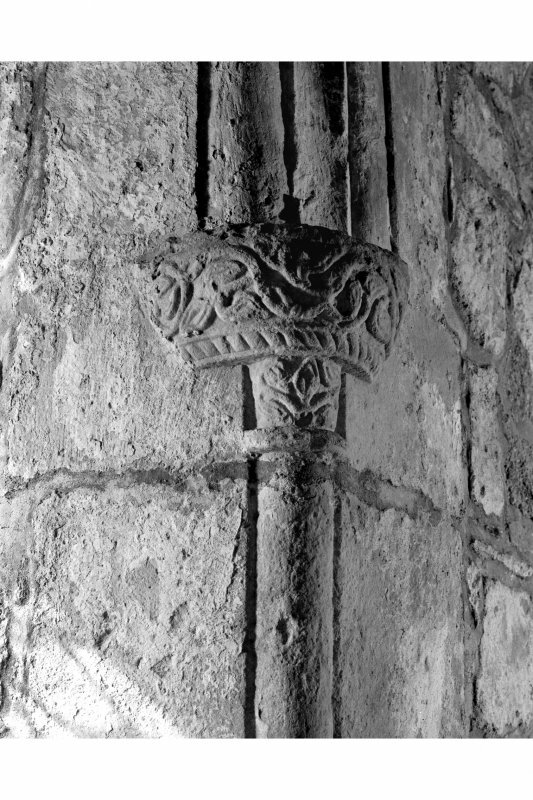 Another group of voussoirs, although very eroded, have rows of dog-tooth ornament, and this arrangement can be found in the N choir arcade of the abbey church, where several voussoirs have been replaced. 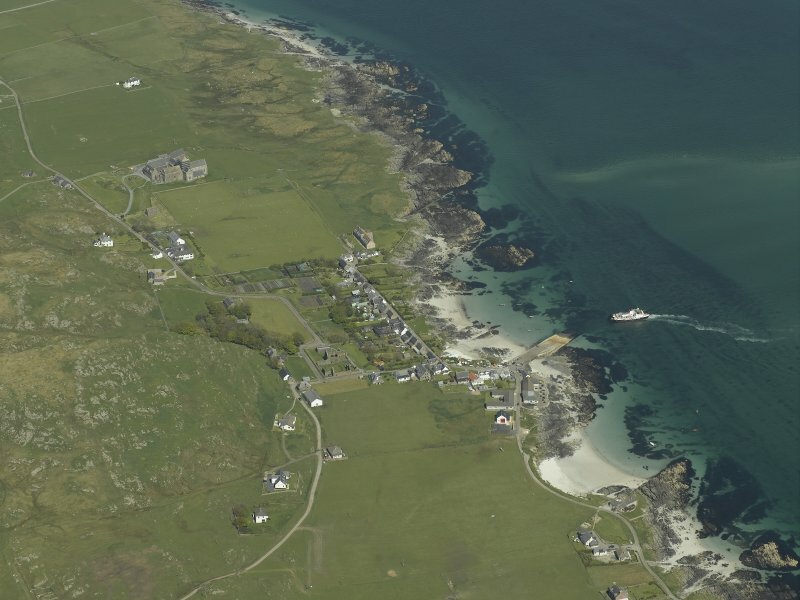 NM 2868 2451 A geophysical survey was commissioned by the NTS as part of a management project on Iona. 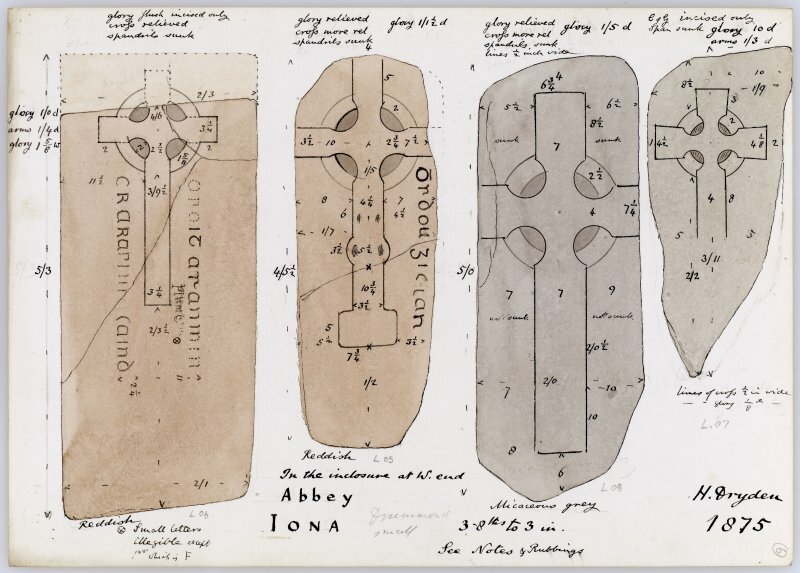 The work aimed to use non-invasive techniques to aid in the identification of any sub-surface archaeological features in three fields to the N, E and S of Iona Abbey. In particular it intended to provide more information about the system of field drains in the area, including a broken field drain to the S of the abbey, which had caused severe water-logging. to the vallum. The resistance survey identified an apparent return at the eastern end of this feature, where it turns to run SSW–NNE. 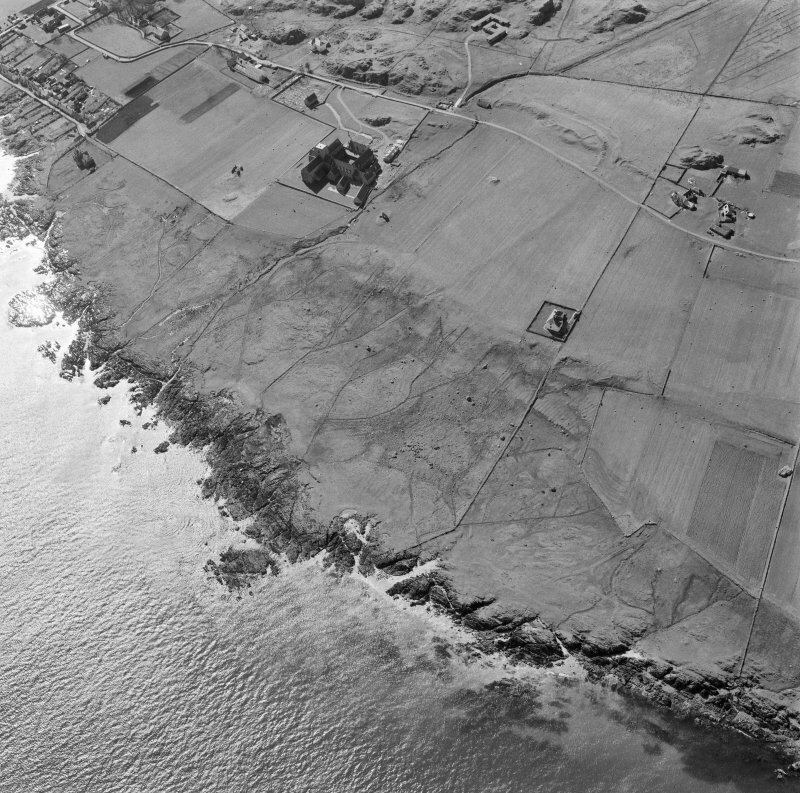 This feature coincides with an earthwork recorded by RCAHMS. The resistance survey also detected a possible enclosure associated with the Bishop’s House. A series of ditches and enclosures were visible in the resistance data from the southernmost field surveyed. For example, a possible rectangular ditched enclosure was recorded immediately SW of St Mary’s Chapel. Some of these features, particularly those along the W edge of the field, correlated with anomalies identified during the gradiometer survey. NM 28683 24515 (NM22SE 5.00) The final two phases of the assessment of the abbey’s carved stone collection were completed by October 2012. 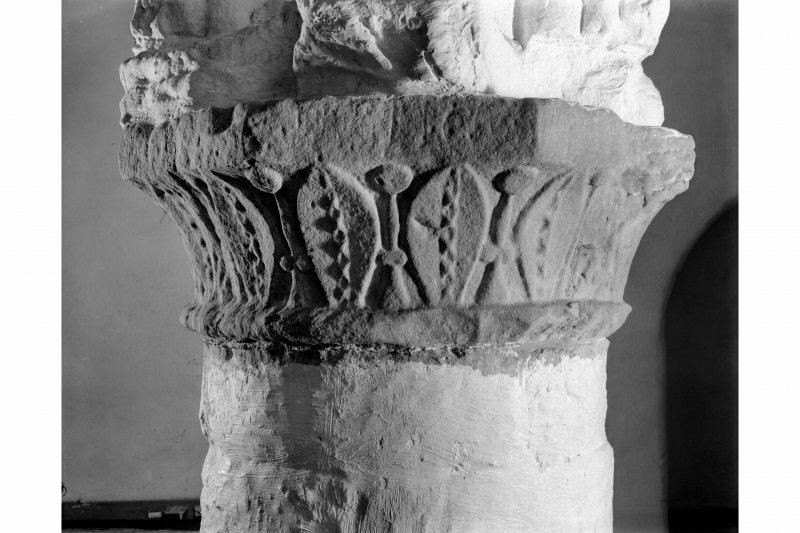 The stones in phase 3 are stored in the roof space and consist mainly of stones from the abbey’s cloisters – column bases, shafts and capitals, as well as voussoirs. 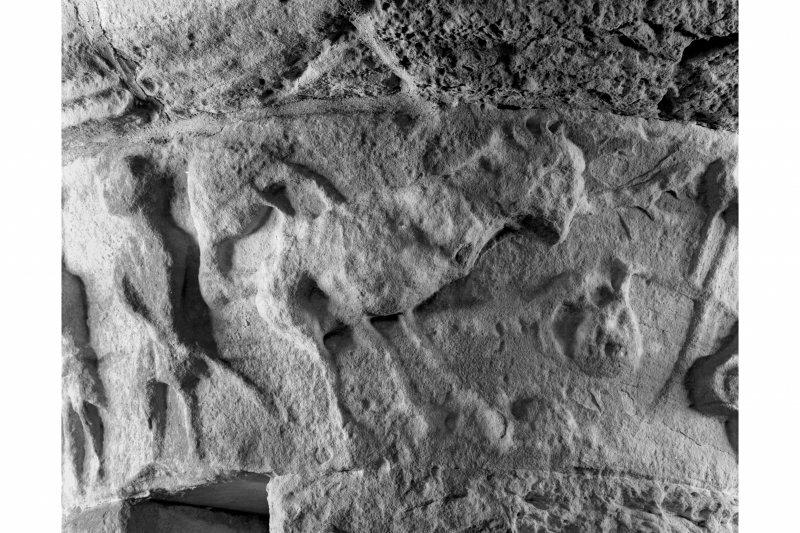 Although these stones are extremely weathered, traces of the original decorative carving can still be seen. 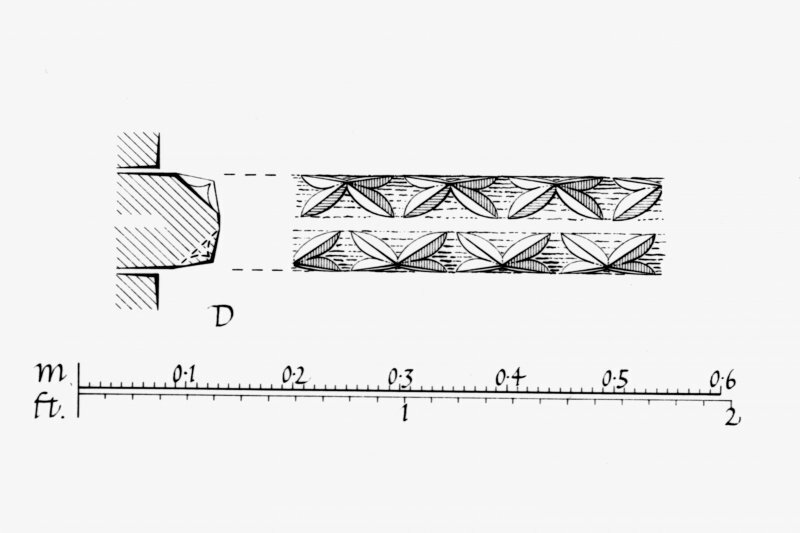 It is also possible to see how the column bases and shafts were intended to be fitted together, with mortice and tenon joints visible on column bases and shafts. 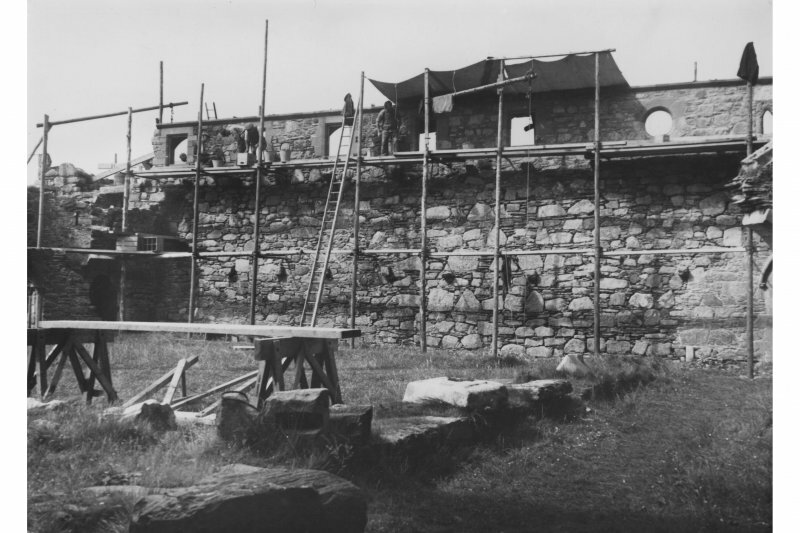 The stones included in phase 4 of the collection had been removed from Iona many years earlier, and were stacked outside the Columba Centre in Fionnphort. The stones in this latter group were left over from the 1960–70s’ restoration and replacement work in the cloisters. So the stones in phase 3 would have been removed to allow their replacement with these modern versions in phase 4. Again, some of the stones were column bases, shafts and capitals, but the largest group were voussoirs. 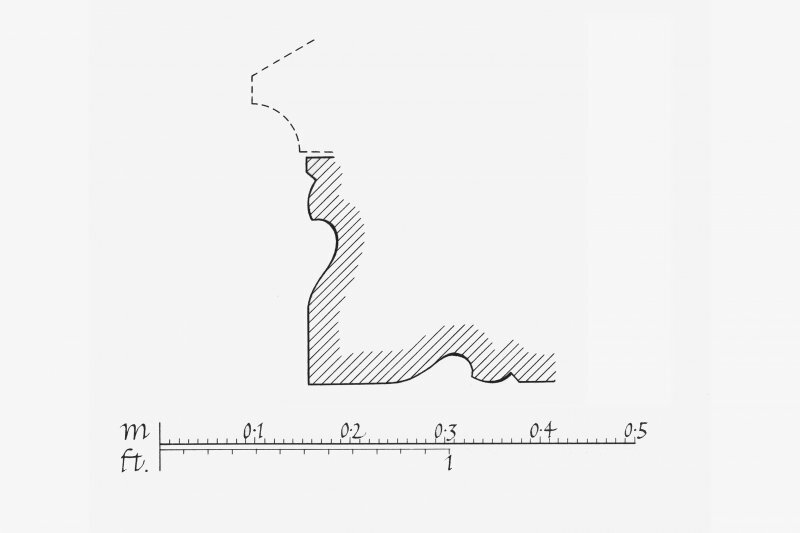 There is a deliberate differentiation in these modern versions, whereby the dog-tooth ornament is simplified to create a smoother surface profile. Another group of stones was left over from restoration work on the night stair, forming a set of coping stones. Some of these had still legible names incised in the ends, eg Black, Thompson, Weatherup, Summers and Collins. 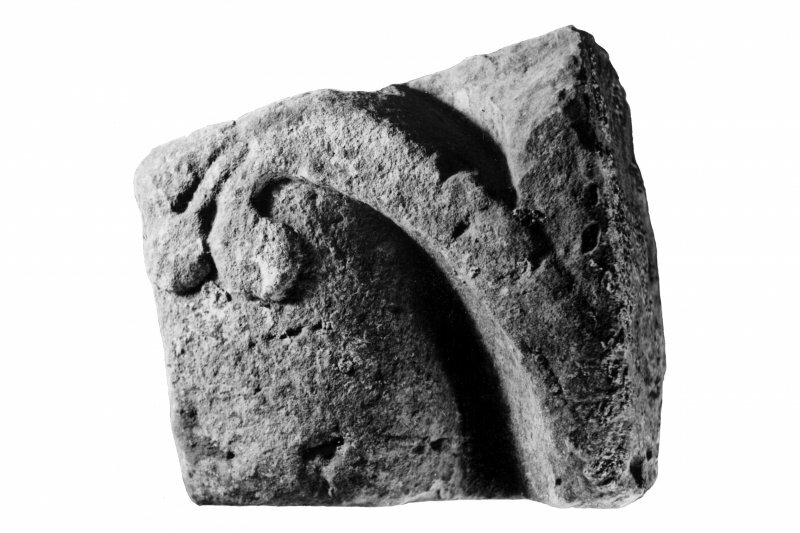 Finally, there was one intriguing piece which appears to have been a practice stone for a cloisters capital. 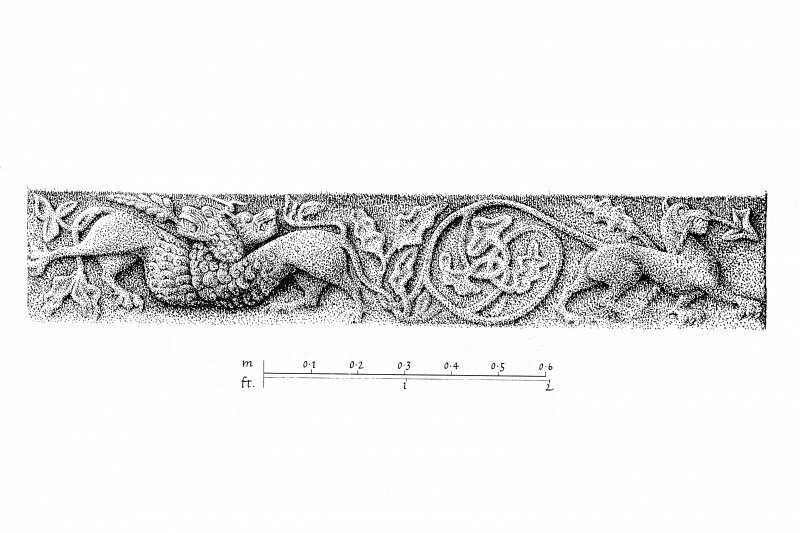 This has a very clear low-relief carving of a thistle on a chamfered edge, and is a simplified version of a capital now in the cloisters, which shows a similar thistle on a paired capital. NM 2859 2453 (centred on) A series of geophysical surveys was undertaken 18–21 September 2012 at Iona Abbey in advance of the construction of a proposed new ticket booth. The surrounding area of lawn N of the Torr an Aba was also surveyed to provide information about the immediate environs. The survey covered a 0.32ha area of lawn W of Iona Abbey, between the public road, Torr an Aba and the Road of the Dead. The SW area is level, but rises at a gradual incline toward the NE half way across. The lawn is flanked by the steep sides of the Torr an Aba to the E, a boundary wall to the W and N, and cemetery wall to the S.
This series of geophysical surveys has produced good quality data, and important potentially early medieval findings include the possible continuation of a vallum ditch across the S area of the survey. Other possible monastic settlement remains were confined to the S half of the survey, in particular the area N of the possible ditch and the old road. Notable among these was a possible enclosure and building located by the radar at depth. 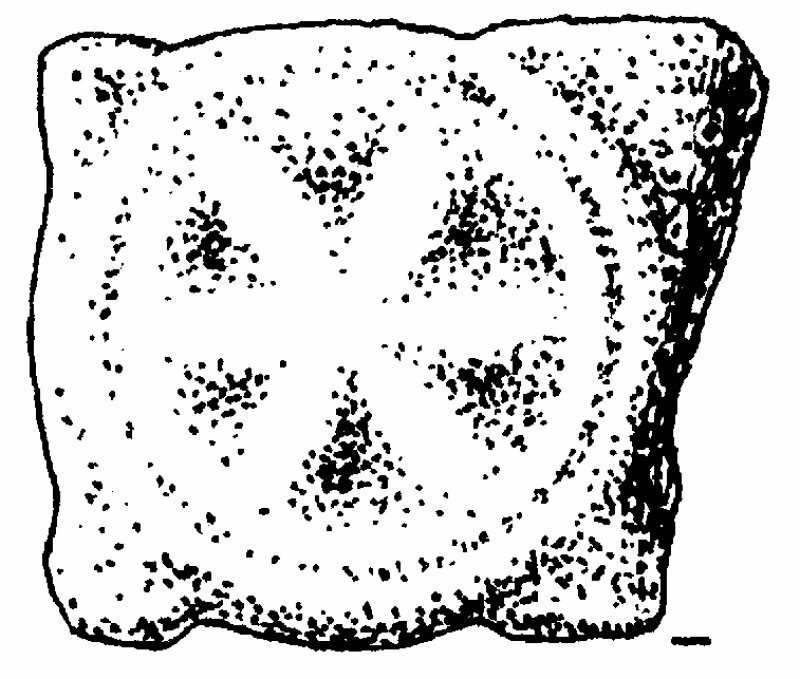 This has the potential to be very significant in situ Early Christian monastic remains, which are worthy of further investigation. Several probable excavation trenches associated with Thomas’s investigation in the 1950s and 60s were also located. A programme of excavation will be necessary to resolve the character, date and significance of the archaeological remains. NM 2856 2448 Access gate construction: Two small post settings, each 0.4 x 0.4m, were dug at the SW entrance to the site. 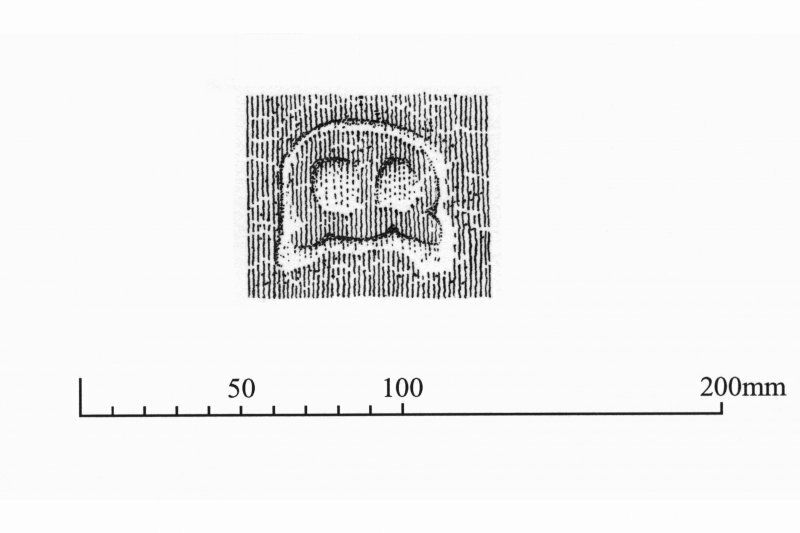 A crude cobbled surface was recorded at a depth of 160mm. NM 28683 24515 (NM22SE 5) A ground penetrating radar (GPR) survey was undertaken, 5–6 November 2016, over several areas within and around Iona Abbey. The survey, which forms part of wider research project (see below), aimed to assist this research by placing features revealed during past excavations in a wider context. A total area of c0.43ha was investigated. The GPR survey has detected a wealth of anomalies, although the data is not particularly coherent in some areas. This is not unexpected given the degree of change and development over the lifetime of the site. The clearest anomalies are due to former paths and presumed access roads and drainage features across the site. Anomalies of potential interest have been identified within the cloister area which may indicate structural remains. Immediately to the W of the Abbey there are suggestions of well-defined areas of paving and possibly associated paths which may be significant. Additional anomalies which may indicate earlier structures have also been detected. Similar responses have been recorded to the N and E of St Michael’s Chapel. possible structural remains. This may be due to rubble and paving masking responses from deeper features. However, it is possible that the complexity of the data is indicative of a wealth of archaeologically significant buried deposits. NM 28683 24515 (NM22SE 5) Two trenches originally excavated in 1956/7 by a team led by Charles Thomas were re-excavated to obtain radiocarbon dates and environmental samples, 13 May – 3 June 2017.
construction, bounded by a stone kerb and may be a later field boundary. Trench 2 (NM 28662 24484) expanded on Thomas’ Cutting 11d, which had exposed an unusual dry stone wall. Excavation revealed that the wall was a revetted foundation for a structure with a curved end, possibly an apse of an early chapel, such as that at Dunfermline Abbey. The walling, which was battered, survived to a height of 1.0m, and was composed of local unfaced boulders up to 0.7m in length. The upper four courses had been rebuilt and added to in 1957 to leave a short section outlining the wall’s position at the surface. 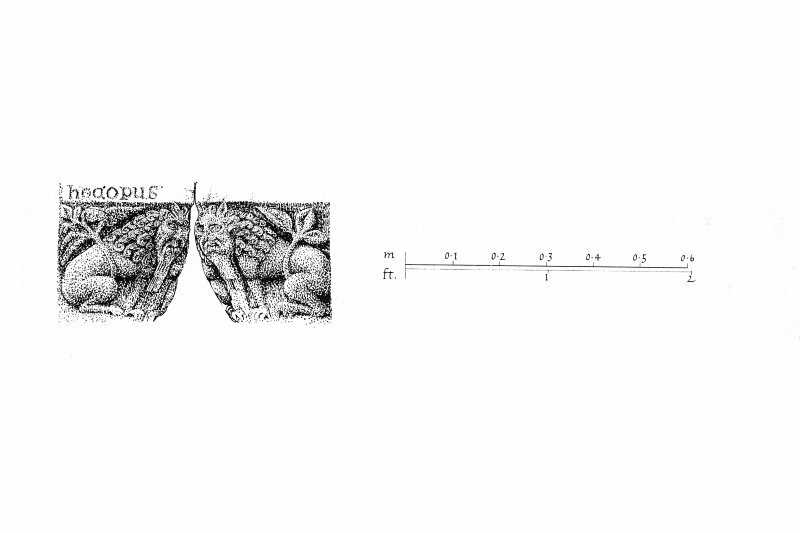 The wall was c0.8 m wide, at least 6m long, and the curved part appeared to have a well built inner face. A spread of similar large boulders encased in purplish clay lay to the E, suggesting the collapse or destruction of a clay-bonded superstructure. The structure appeared to have been demolished and robbed, and was sealed by spreads of building debris and mortar-mixing layers. 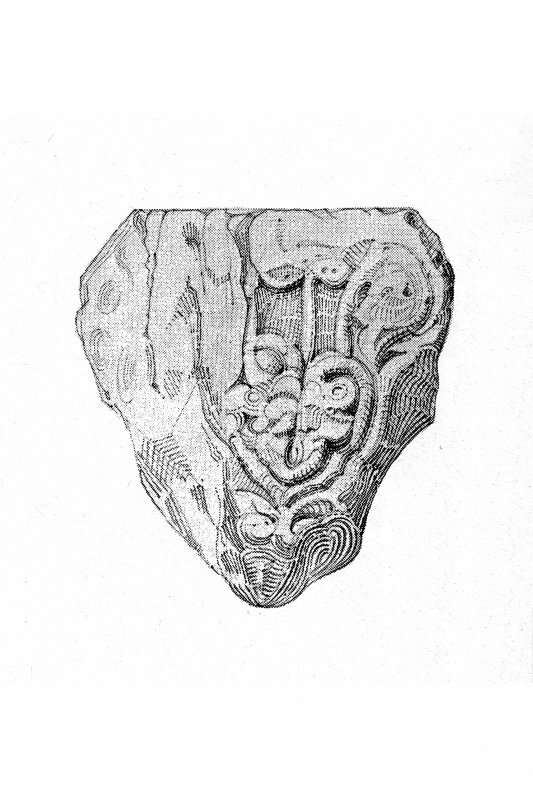 This material contained medieval pottery including Scottish white gritty ware jugs, and was interpreted as debris from the construction of the 13th-century Benedictine Abbey. A series of deposits of sands, gravels and soil on the exterior of the walling included a thick layer of iron-working debris. These layers predated the demolition of the walling and were interpreted as levelling deposits, but are so far undated. The walling was built directly on a peaty buried soil and appeared to be the first feature constructed in this part of the monastic enclosure. 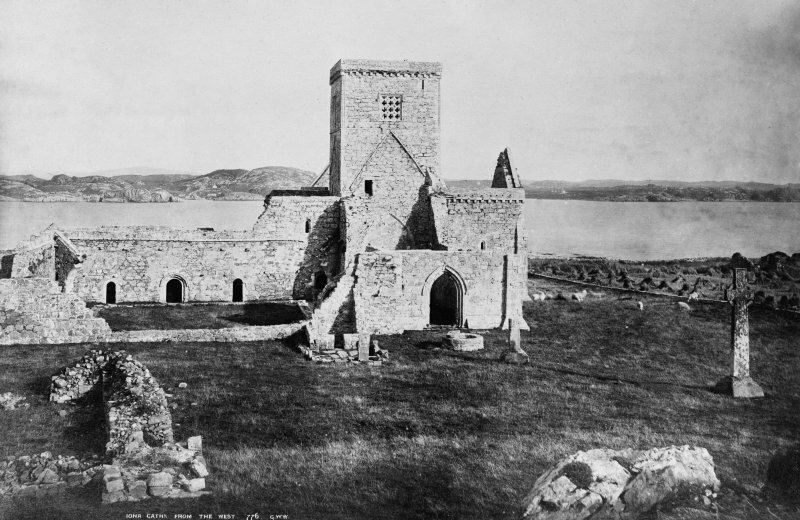 Later features included a massive stone-pit associated with the renovation of the Abbey church around 1900, and a roadway associated with the Iona community renovations in the 1930s. revealed a broken rubble drain which had been repaired with a plastic pipe, but the area was continually flooded and no further investigation took place. Documentary references refer to an old well in this area, Tobar Odhrain.